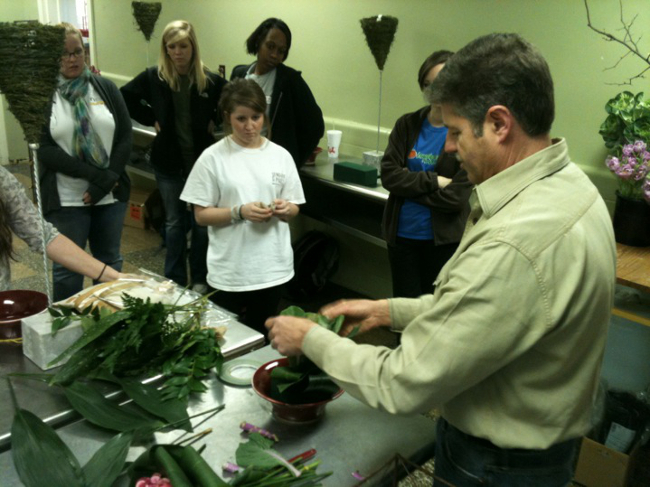 Mississippi State University and Dr. James M. DelPrince, Ph.D., AIFD, PFCI are not just staples of a strong history of degree level floral education but one of the last major American Universities offering floral education programs. With the onsite flower shop, The University Florist, and 20 Floral Management concentrated majors offered by MSU and Dr. DelPrince, students are guaranteed to be prepared to go into floral careers throughout the industry ranging from retail, wholesale to media and product development. Assistant Professor of FLoral Design Opening Click Here for more information! Floral Management is a concentration in the Horticulture major, Department of Plant and Soil Sciences, within the College of Agriculture and Life Sciences. Mississippi State University is a Land-Grant Institution of Higher learning located in Starkville, Mississippi. 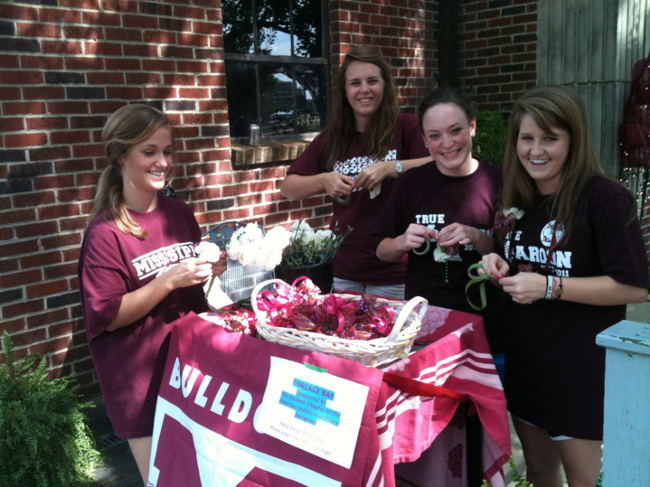 Members of MSU’s Student Chapter of the American Institute of Floral Designers offer football game attendees corsages in the school colors of maroon and white, celebrating and continuing a football tradition. Universities generally require a terminal degree in the applicant’s area of expertise. To become a university professor, a doctorate may be required in the area of expertise or related area. Some university faculty hold positions with master of arts or master of sciences degrees if the job allows. Generally, the parent department of the program of study sets employment guidelines. Floral design teaching is usually situated in departments where horticulture science is taught; hence a dominant environment of science may surround teaching and presentation of floral design for the faculty member. Another strong consideration is whether or not the job is tenure track. Tenure is a career long contract with the university and can only be obtained through regular, rigorous evaluation based upon the faculty member’s performance in the tripartite mission of the U.S. Land Grant system. This involves high levels of performance in teaching, research and service. Not all floral design teaching positions in higher education are tenure track. 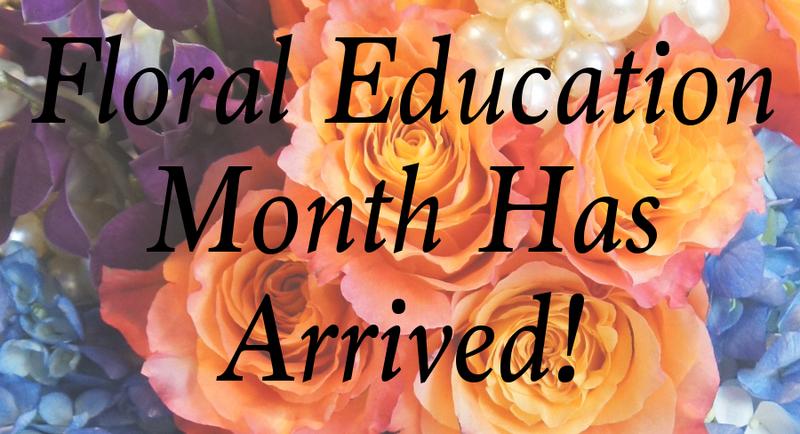 Not all Land Grant institutions have floral design programs or even singular courses. Departments, colleges and the university itself must realize a need for such study, develop proposals from faculty within, review and approve the proposals. Such proposals require a demonstrated need for the courses, faculty and administrator support, and much time, measured in years, for development. Being a university faculty member at a Land Grant Institution entails understanding and skills in floral design along with commitments to scholarship, teaching and service. Beyond teaching floral design theory and practice, floral design faculty must develop scholarship through academic writing, juried exhibitions and/or other creative outputs on par with peer reviewed journal articles. 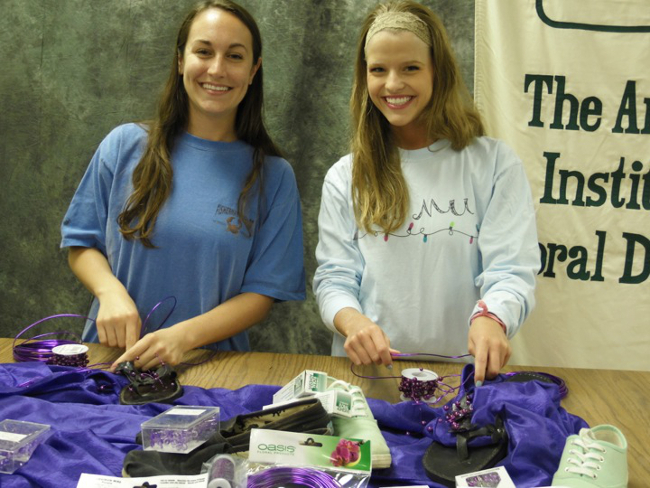 Interaction with members of the community and beyond such as community workshops, floral industry organization leadership, trade journal writing and garden club demonstrations illustrate some of the types of service that constitute university outreach. Teaching may involve formal courses in floral design, from foundational, survey-type courses for horticulture majors and others, to advanced courses in wedding floral, permanent botanical and others. A floral design instructor/professor may have other teaching assignments such as to oversee the operations of an on-campus retail floral shop, horticulture courses (for example, introduction to gardening, interior plantscaping), student advising and more. A faculty position at a college or university is dynamic and challenging every day. It requires a sincere effort to continually build the program through better teaching, scholarship and outreach. 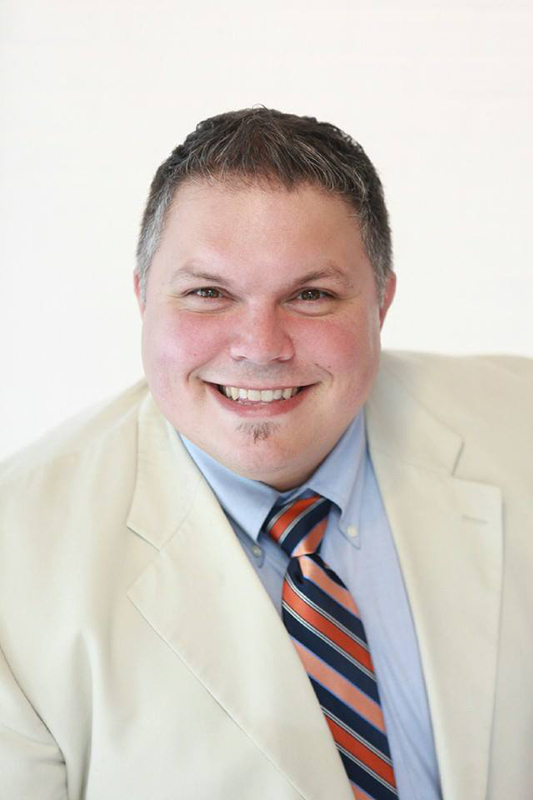 Ty Leslie, AIFD, of Charleston, South Carolina has been an AIFD Artist in Residence. Dried floral materials courtesy Knud Nielsen Co., Evergreen, Alabama. 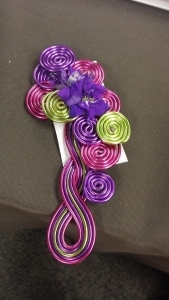 Who have been some of the most influential floral industry guest speakers that Mississippi State University has hosted? 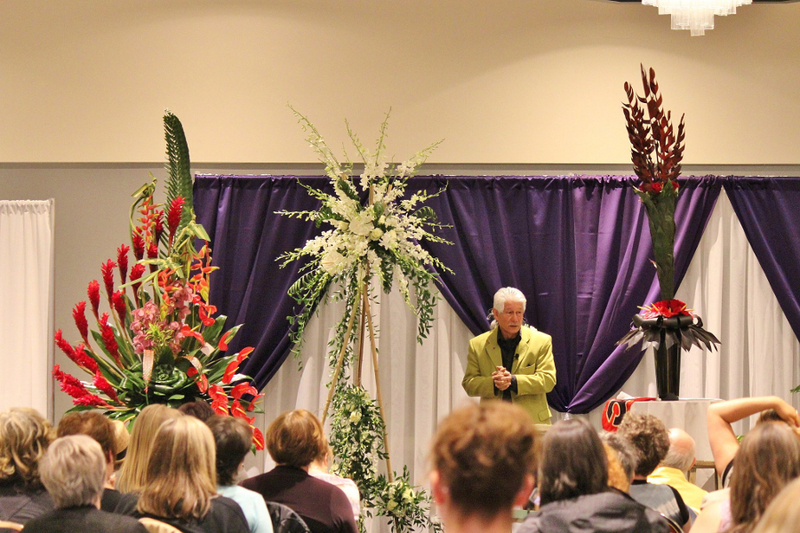 Over the years, MSU has hosted dozens of high-profile, creative floral designers to demonstrate construction and offer educational business advice to our students and beyond. As an active Student Chapter of the American Institute of Floral Designers, MSU is required to host at least one Artist in Residence program per year. Mississippi State University held the first ever AIR Program with Dan Upchurch AIFD in 1988. Brooke Raulerson, AIFD of Fernandina Beach, Florida instructs students on the finer points of competition in her Artist in Residence visit. Several years ago, one of our university presidents Dr. Donald Zacharias gave the commencement exercise speech as one of the last things he did prior to his retirement. I remember his message to the graduates because it was pure and clear, “always tell the truth”. I believe to be a good teacher, you must be a good student, and continue to be a student. Seeking out the truth and keeping on its pathway allows one to be creative and not mired in problems. As a technique in the classroom, unless a student truly needs help, I find it is best to leave them alone when they design. I am not stating that the teacher leave the facility, but simply allow the student to finish their work. As a young teacher, I dove in too early to rescue what I thought was a bad placement or perhaps a meandering line. It bothers me to see students, no matter their age or level, interfered with while designing. One of the things I would like to do is to teach floral design slowly, spending an hour to demonstrate a design, and then offer students 90 or more minutes to replicate it, then take another hour for critiques, whether one by one or as a group. A slower approach sounds so good in these days of frenzied speed and need for practice. Kailie Dunlap and Madeline Hawes, former MSU-SAIFD Presidents, help to promote the Student Competition at the AIFD National Symposium. I think some of the best designers are hidden within the industry. They are well known by their clientele, but not necessarily by other florists. They may or may not interact with professional organizations. I think it is not best to worship at the altar of celebrity, but to gain knowledge from many sources. 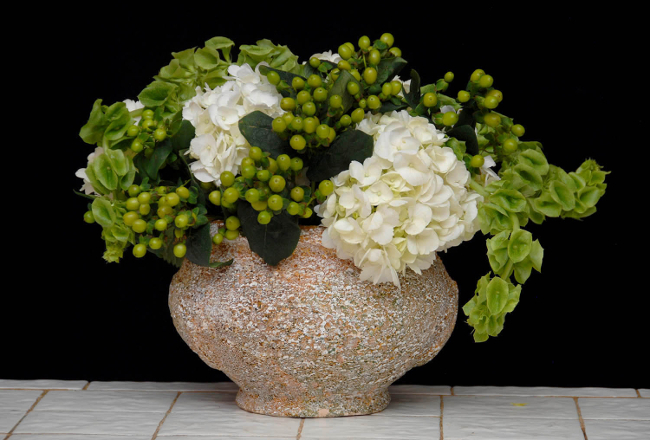 I notice altogether too often, the designs made by celebrity designers, using boxes of Hydrangea and Phalaenopsis in their event designs, are essentially creating hemispherical mound arrangements. This is the same design form we teach and learn as a foundation in floral design. In other words, study and achievement of introductory theory will help a florist succeed. 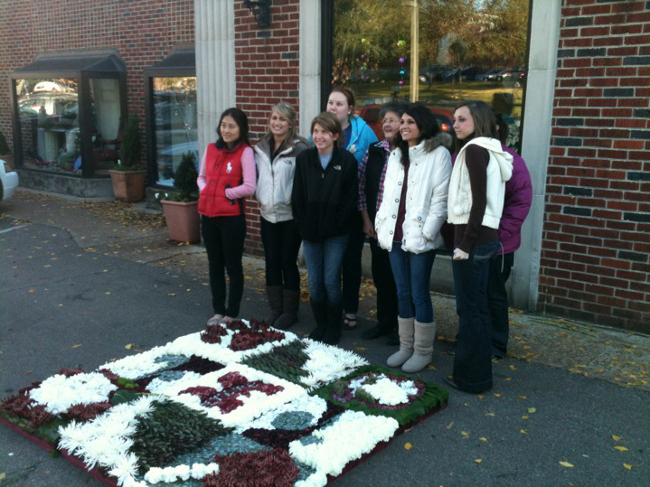 The Sympathy Floral Design class as one of many projects, made a floral blanket, similar to the historic AIDS Quilt, using Oasis Sculpting Sheets. The design was displayed outdoors on the campus for one week and remained fresh in the cool weather. My personal opinion is that teachers, and especially students, get caught up in technique rather than underlying theory. It should be an industry standard to have a collegiate degree in horticulture in order to be a florist. Florists go blindly into a cut flower cooler without really knowing plant material. If you do not know something, you cannot fully appreciate it. 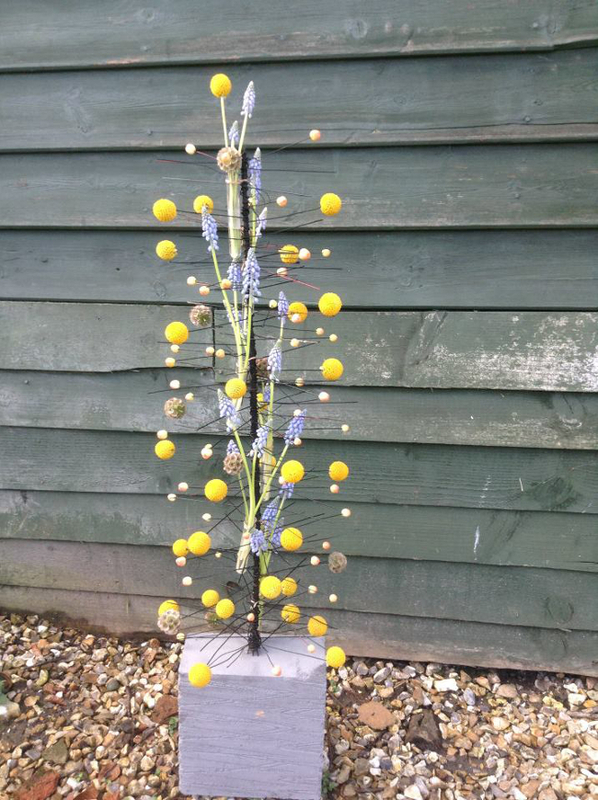 Too many florists who take pay for their work do not know, and therefore appreciate, the principles of floral design. Because of this, their vocabulary and communication is limited. I sympathize with them because this is how I began my career. I loved flowers, so I registered for a vendor’s license and sold flowers from my parents’ basement while I was in high school. 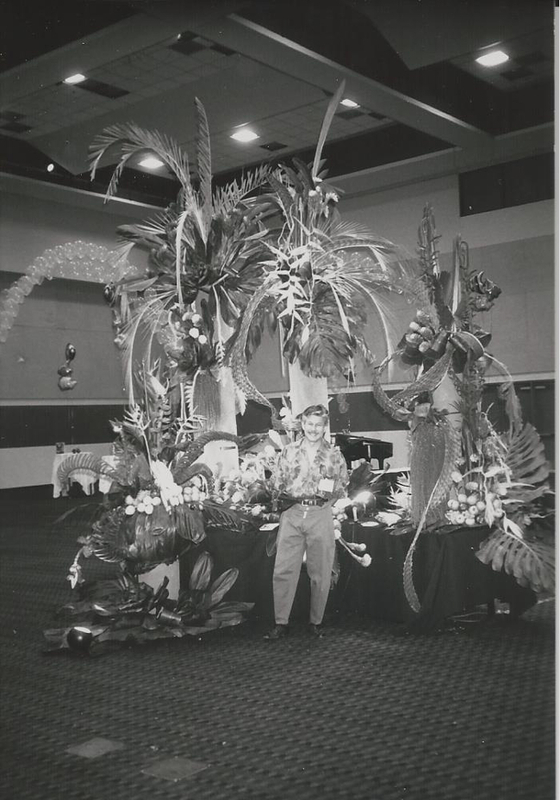 During my college years, I had the great fortune to be an intern with the Ohio Florists Association, which is now AmericanHort. We conducted numerous surveys with attendees asking them what topics they wanted to learn about or what their problems were in the workplace. Most always, the common problem was communication. It may have been lacking between employer and employee or with customers or the general public. So, this goes back to my point: if you do not know the common language, how can you communicate effectively? 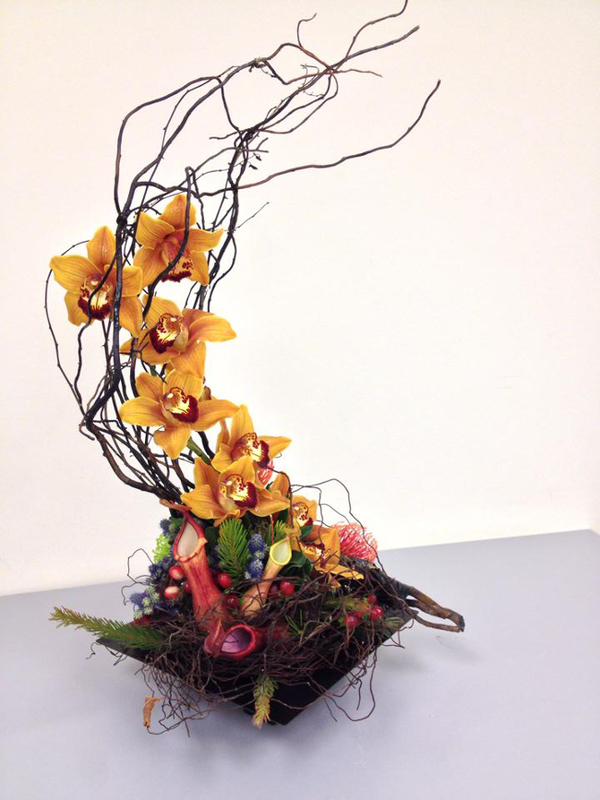 This is one of about 15 projects students complete in Floral Design, a course with an enrollment of about 90 students each semester. It is an art elective on the university core course list. I feel that Mississippi State University is very supportive of our formal degree program and the endeavors of The University Florist. This comes from much hard work on the part of faculty and students to deliver the quality possible in learning and teaching. 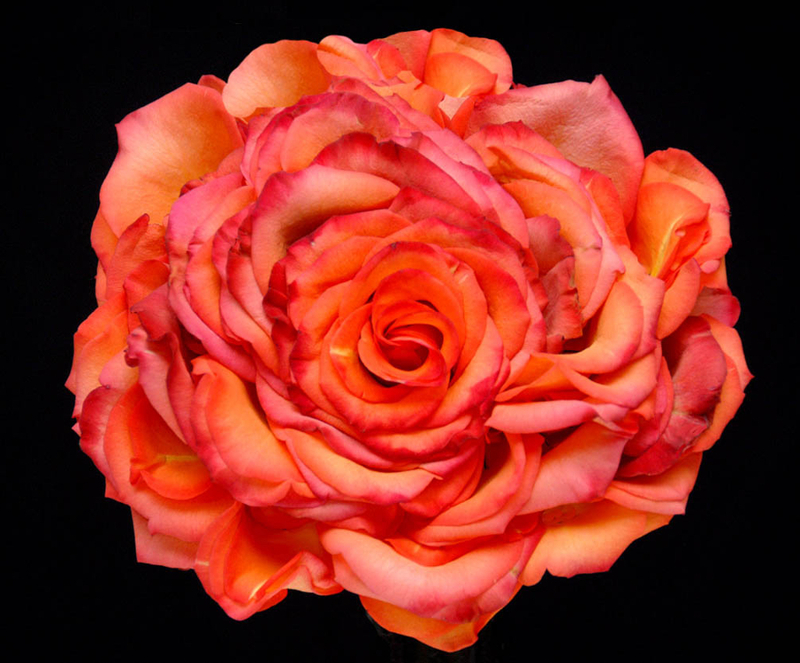 MSU Floral Management is strongly supported by industry and industry organizations. 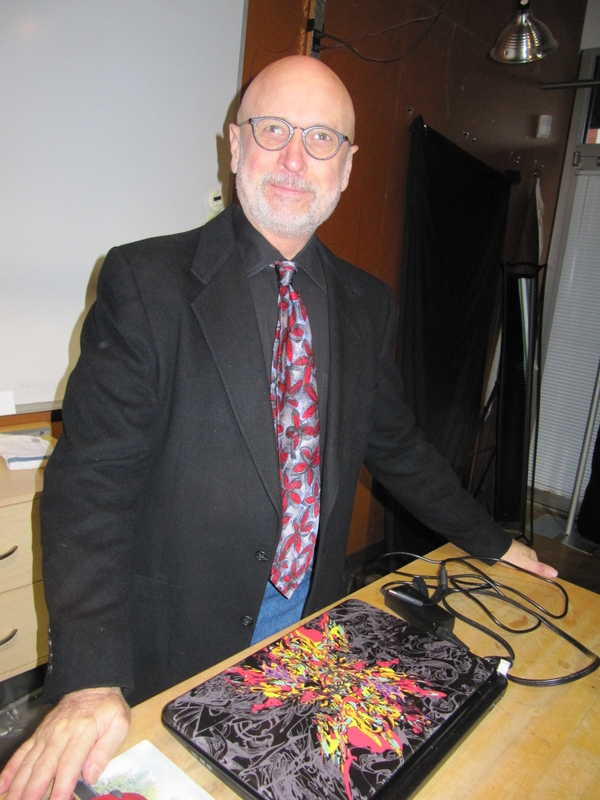 Kevin Coble, AIFD of Memphis, Tennessee shared floral design talent and insights with his Artist in Residence program. 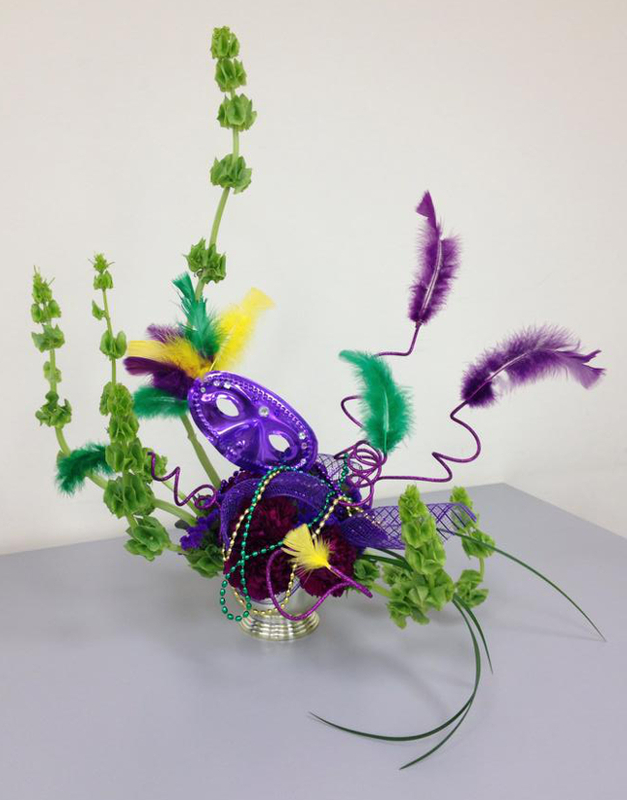 Students are interested in event/bridal floral design these days. In a way, it has been great to see high profile weddings in the news because it attracts people to learning and, in turn, the floral industry. 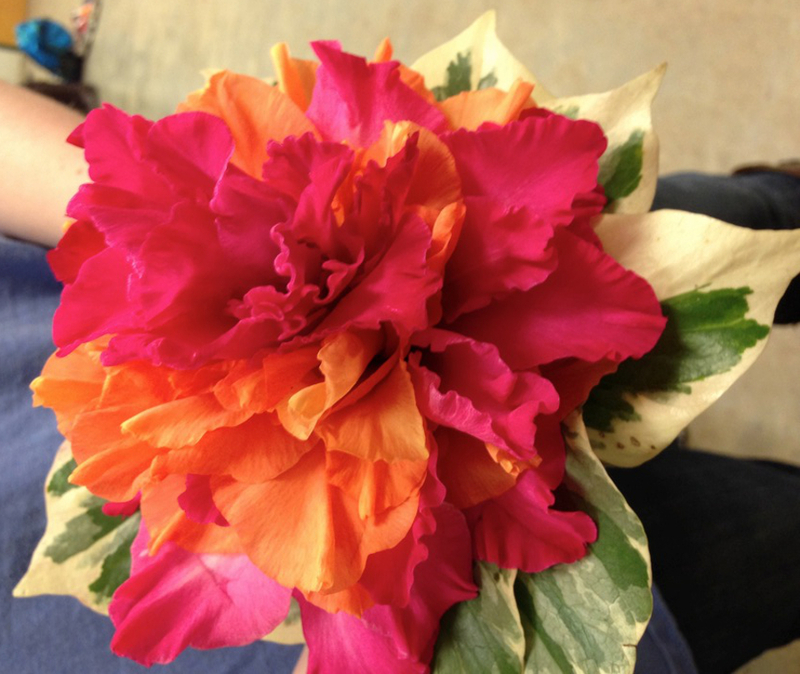 I feel that once students learn about the diversity of floriculture careers, they find their own pathways. In the future, I believe the lines will continue to blur between the science and art of horticulture. I find the students majoring in ornamental horticulture are getting very creative, thus they are enabling themselves to do it all, from growing to designing. I am looking for the floral management majors to delve into growing their own floral material, like florists in the 19th to the mid-20th centuries. I also feel that florist business will be diversified, with revenue streams coming from interior plantscaping, nursery and other departments within the same business. Thirty years ago, progressive shops carried gifts. Many florist shops today have food venues attached, such as coffee shops and catering. Some flower shops now carry clothing, so it will be fun to see what happens next with floral market, a place that attracts creative people who easily become bored with the mundane. 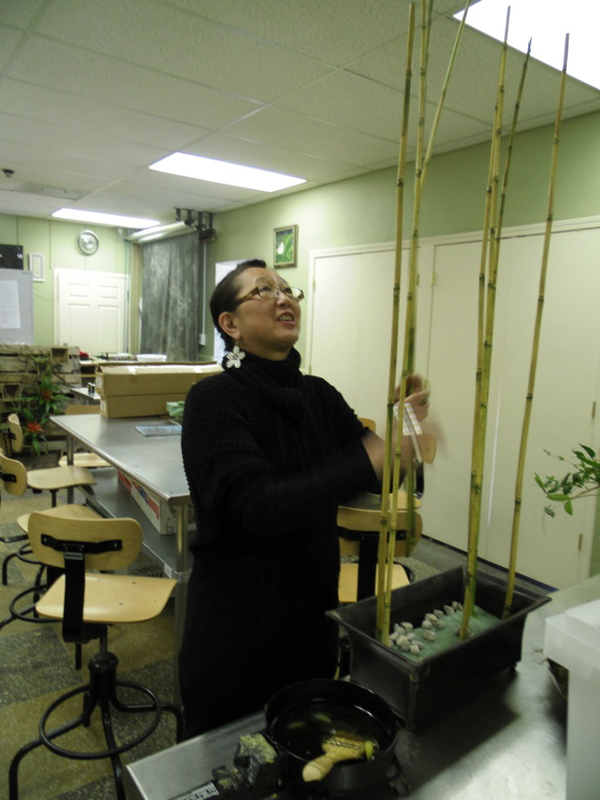 Visiting artist Hitomi Gilliam, AIFD taught students in various classes as well as designed for a community audience. 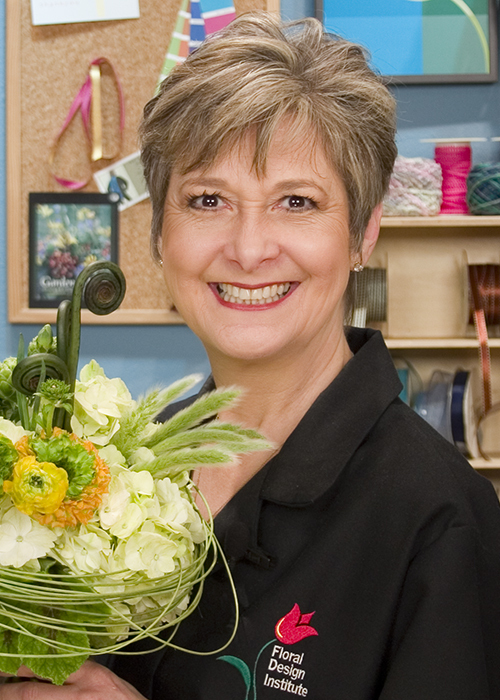 Her Artist in Residence program centered on the importance of professional floristry. 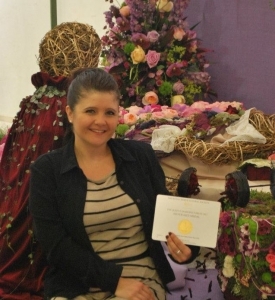 What are some of the best floral education opportunities available to young designers? The American Floral Endowment sponsors the Mosmiller Scholarship, which aids in pairing students with internship sites in retail or wholesale floristry. 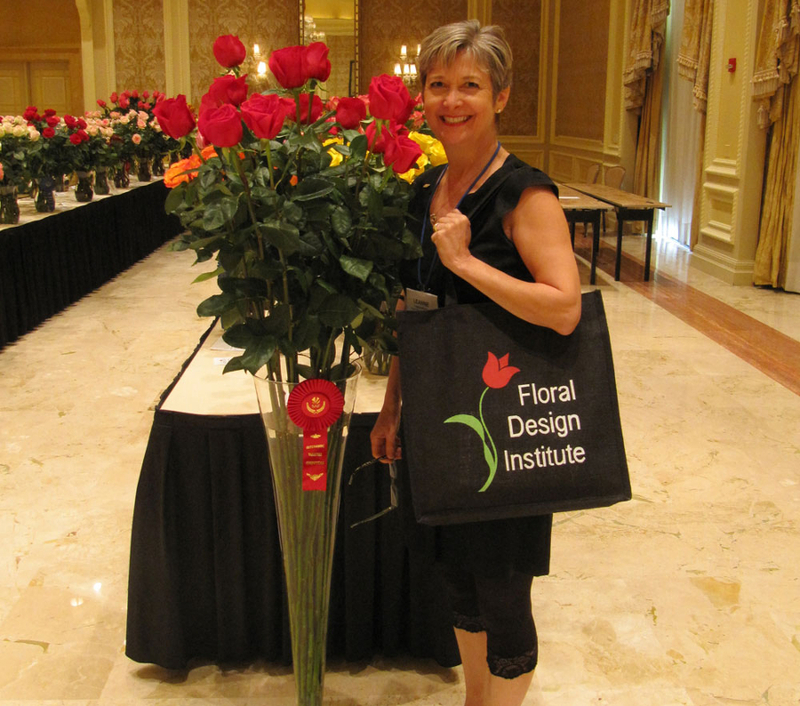 The AIFD Foundation funds scholarships for students in degree programs emphasizing floral design as well as professional florists to attend AIFD Symposia. AIFD continues to offer valuable interaction at the institutional, regional and national levels. I am biased, but I feel that if an institution goes to the trouble of maintaining an active SAIFD Chapter, they care to be the best they can be. See this site for a complete list of colleges and universities with SAIFD Chapters. 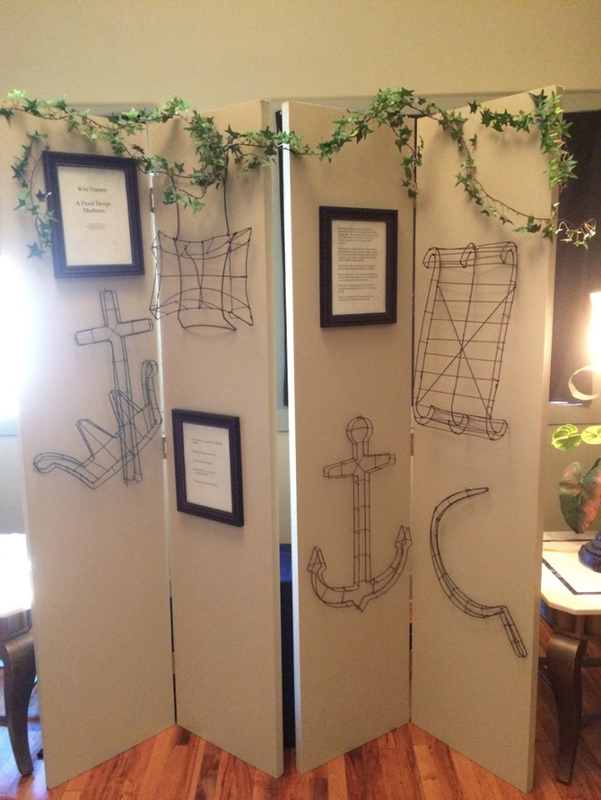 A sample of wire frames from the Leyes Collection housed at Mississippi State University. 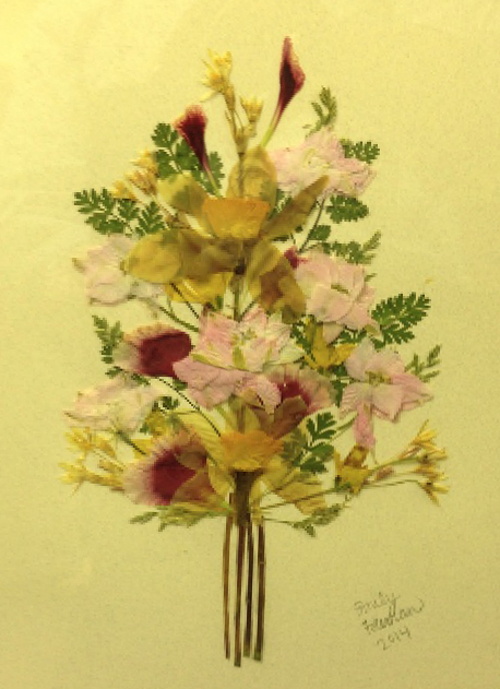 These antique floral mechanics were used as based for designs from the 1860s well into the 20th century. 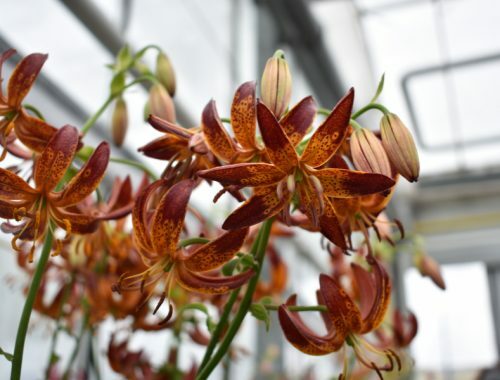 Research in breeding and hybridizing has helped to advance the floral industry. We have plant materials available year-round with larger flowers, more colors and longer vase life. These attributes were born at universities through horticultural research. It is easy for those who do not know the history of the Land Grant Institution to take flowers for granted. 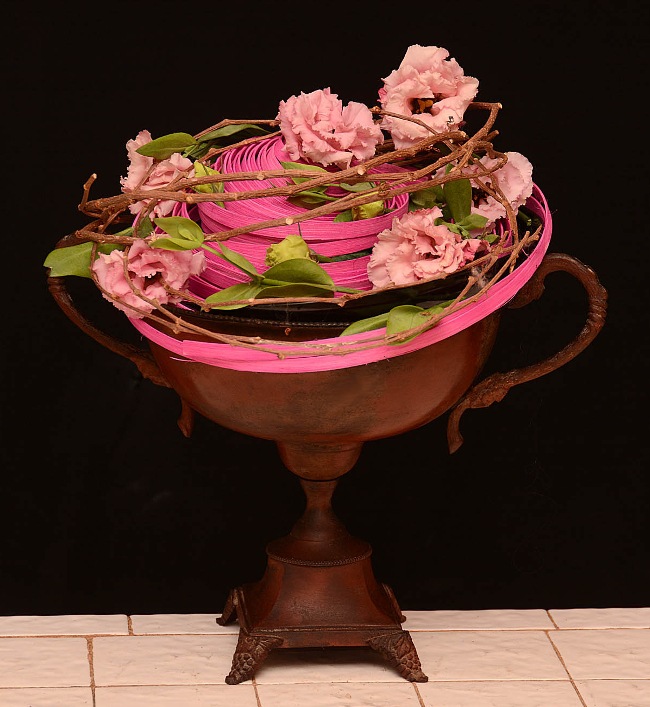 In addition to this, the Internet and on line education has made learning floral design more accessible. It will continue to do so. 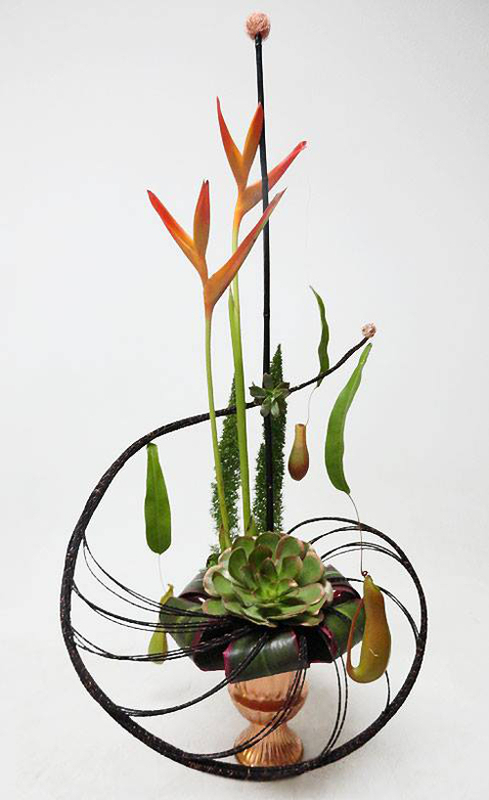 Students practice contemporary work as well as traditional and even forgotten floral design styles and techniques during their degree program. 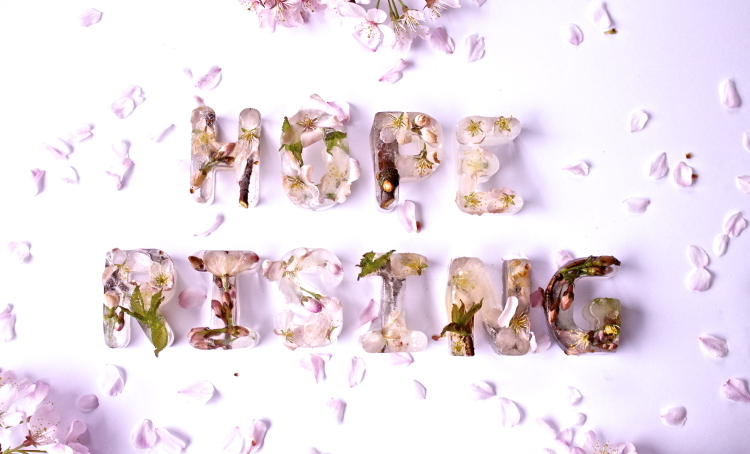 Design by Abby Jenkins. I do feel there is awareness, but the underlying problem is the low pay scale for designers and awareness of educational opportunities. If the industry as a whole could offer better pay, it would attract more talent. Other sectors of the industry could partner with our formal education programs, including wholesaling, transport, mass market, and manufacturing. Bachelor of Science students are equipped to take on jobs with greater responsibilities after graduation, particularly after semester-long internships and upper level coursework. They just need encouragement to leave the family nest. I have seen terrific talent leave with a degree in hand, but search for jobs too close to home, thus keeping themselves from better careers. Talent, honesty, learning, daring and passion are necessary for success in floral industry careers. We look forward to all the talented Mississippi State University designers and wish them all the best of luck with their futures in our industry. 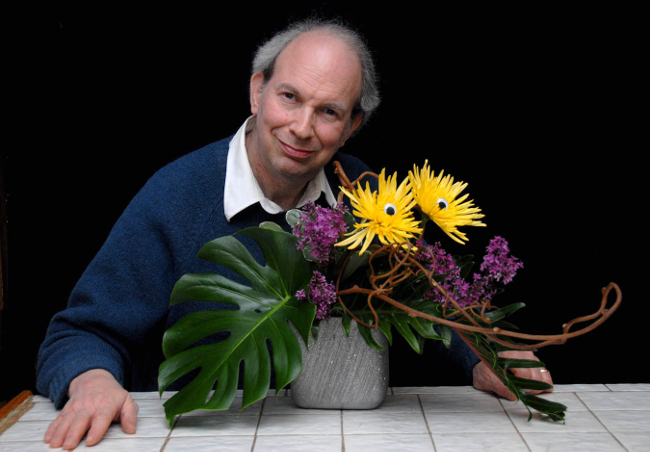 Thank you to Dr. James M. DelPrince, Ph.D., AIFD, PFCI for taking the time out of his busy schedule for all of our Floral.today followers and to help us all better understand floral education. Join us tomorrow as we will be bring you interviews and articles every day till June 30th! Located in the beautiful heart of Boston you will find The Rittners School of Floral Design lead by it’s director, Steve Rittner. 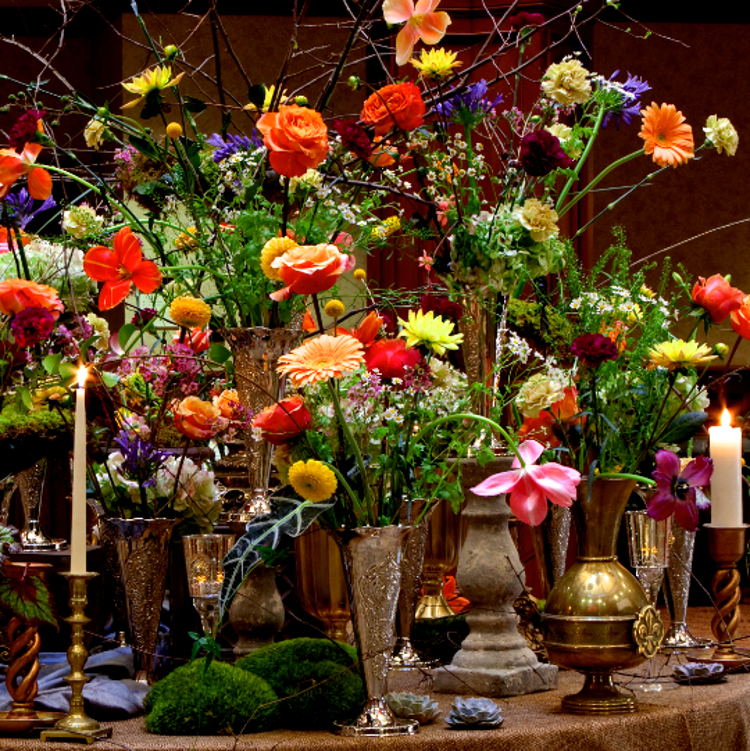 With Steve’s Doctorate in Education combined with an extensive knowledge of floral design, Rittners School of Floral Design creates a unique experience of learning that has structure but stays true to the school’s free spirit and enjoyable atmosphere. 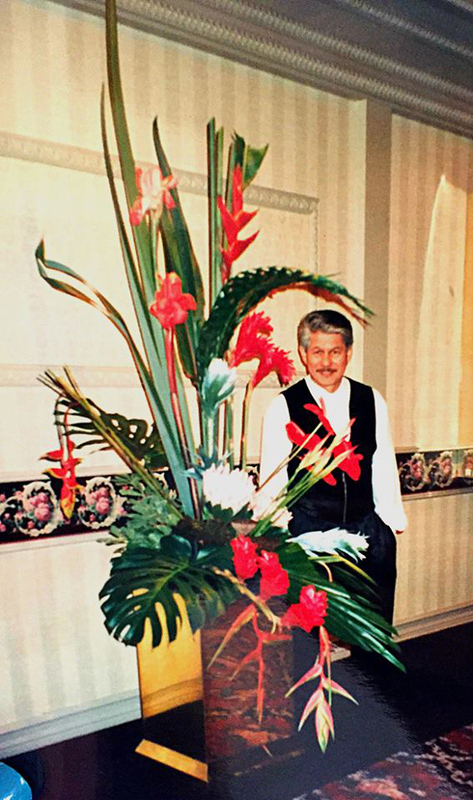 Rittners School of Floral Design has been in the Rittner family for two generations with floral design stretching three generations. YOU CAN FIND ALL THE CONTACT INFORMATION FOR THE Rittners School of Floral Design AT THE END OF THE ARTICLE. 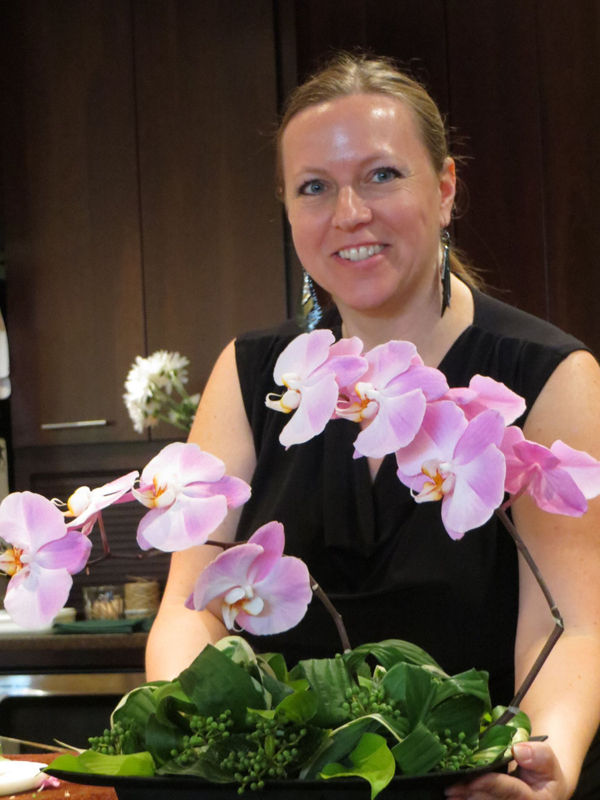 What does Rittners School of Floral Design take the greatest pride in from its floral education programs? We have a range of offerings for differing demographic needs. 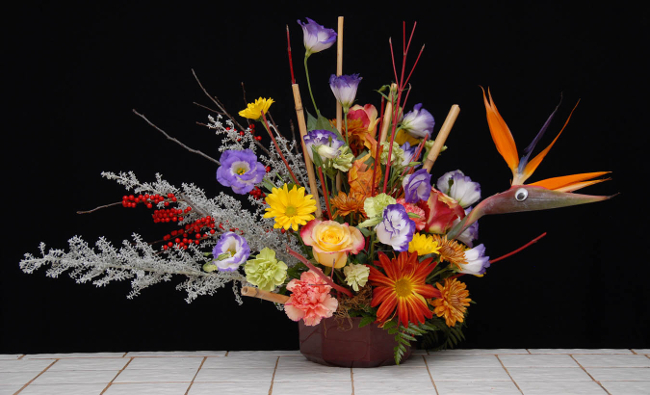 If a student is seeking a longer program in floral art, we offer it, if a student is busy during the day and needs a part time solution at night we have that as well, and we also offer Concentrated Programs for folks who need strong courses of short duration. good, solid educational practices are used at our school. I am a floral designer as well as an educator, I apply my professional knowledge of curriculum design and development as well as my floral art skills to my teaching. I am quite proud of bringing our curriculum and also our teaching approaches into the 21st Century by skillfully using the latest tools of web-based resources, digital content, and digital delivery systems integrated with live demonstrations and hands-on workshop training. 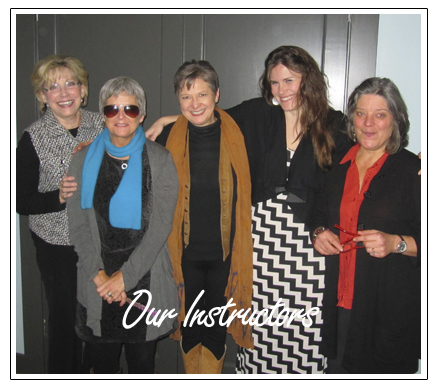 Our programs are designed to be informative and comprehensive yet enjoyable and fun! Independent Floral Schools vs. Flower Shops and University Programs Spending time in a flower shop can be a good way of telling if floral designing as a field is something you would enjoy, but it is not an ideal environment for optimal learning. The primary focus of a flower shop is to meet consumer’s emotional needs through various floral products and services. Floral shops are really set up for floral art production not training. It is not optimal to try to learn a motor performance task when there is a deadline to turn out the work and the focus is on the product for a customer, not the development of the person doing the designing. 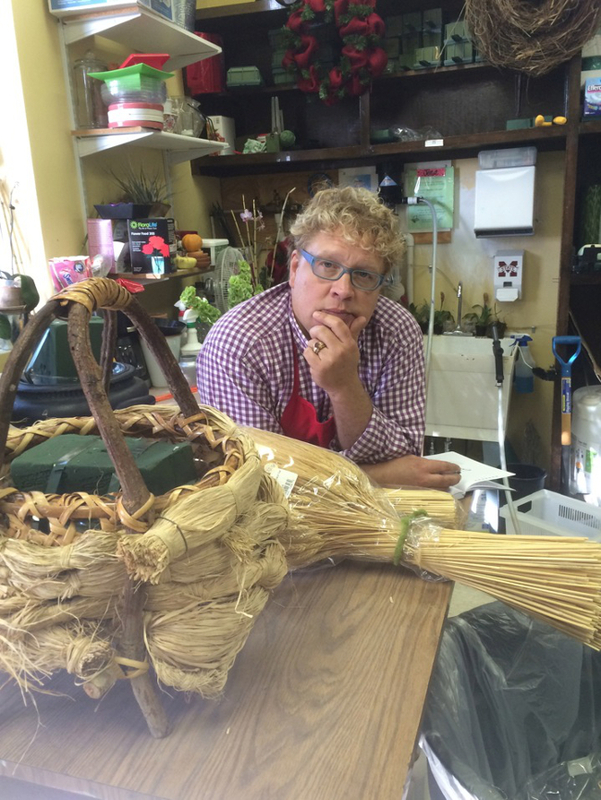 Floral staff are skilled artists, not trained or certified teachers. It is wonderful when one can find an enlightened floral designer willing to “train” but the skill set to do that optimally is rare. The whole concept of the “floral design school” is to eliminate outmoded and inefficient apprenticeship approaches. Many flower shop owners would prefer it if the person seeking employment already has some design training, and simply needs to be shown the unique approaches of that shop. 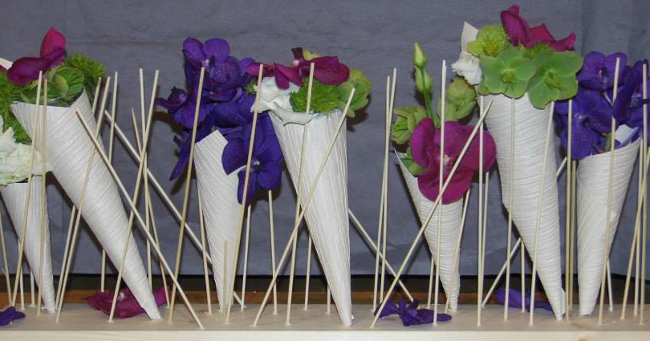 A major requirement of any floral designing program is providing materials for students to use in their designing. This can be a challenge in a University setting where even providing a few chemicals for a chemistry lab is a stretch. In addition, Universities tend to provide all kinds of peripheral courses (eg. Psychology 101 to assist students in dealing with customers, etc.). 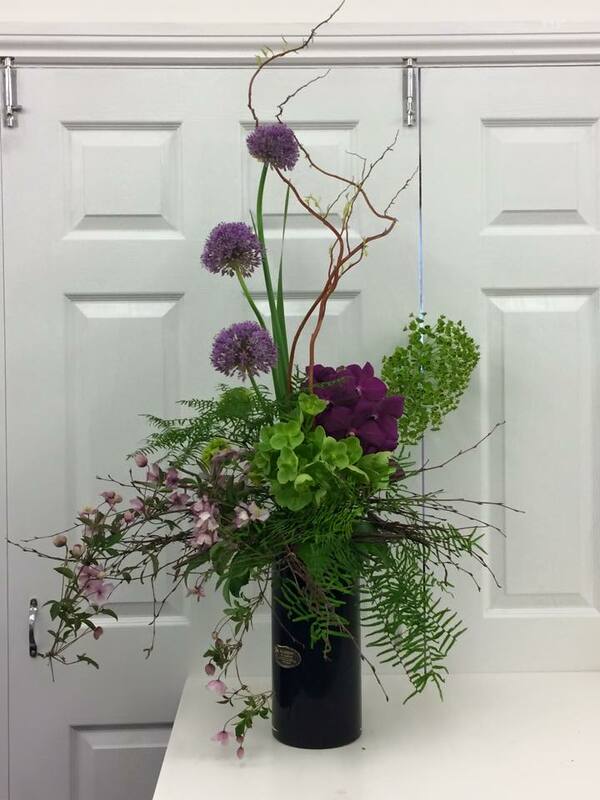 The purpose of an Independent Floral School is to teach very specific floral design skills and to provide lots of hands-on training with plenty of flowers and materials. The challenge to the independent floral school is to provide quality flowers, and materials and still keep the courses affordable. I think that the shortcomings are not those in the floral education sector but rather in the public perception of the floral industry as a whole. One of the biggest obstacles that we face is that people think that because flowers are “natural” and grow in nature, that somehow flowers have or should have low monetary value. 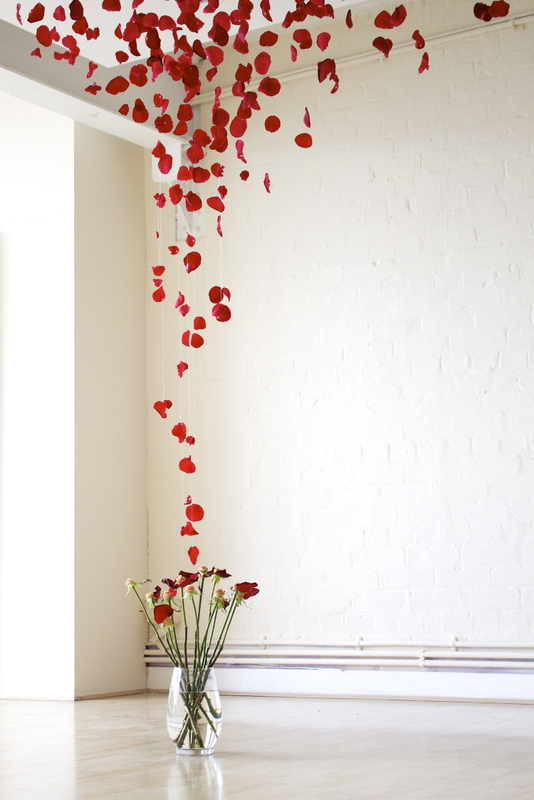 There is always the “sticker shock” when people learn that flowers actually cost money. 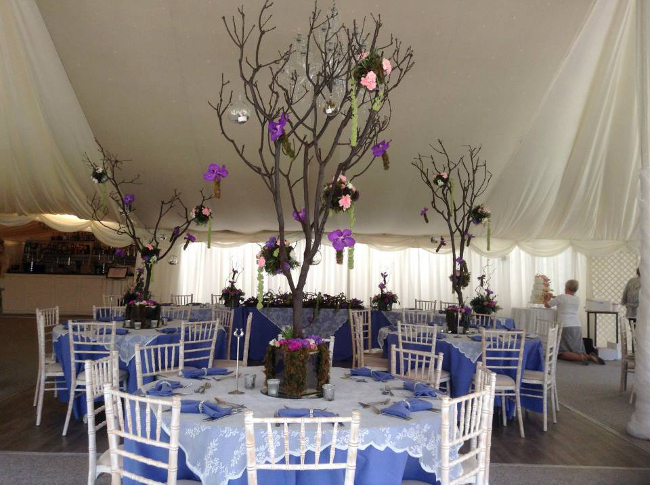 Florists encounter that all the time when designing for Weddings and Events. The same dynamic applies to floral education. Similarly many folks don’t realize that to design with flowers is more than a matter of simply dropping a few flowers into a vase and posing. It does require some very specific skills. It’s amazing how many folks don’t realize that, and underestimate the skills that one needs to be an effective floral designer and that designers need to be compensated for their skills. This is an internal Floral Industry Issue: Many floral designers love to complain about how hard they work or about other industry issues.There are a lot of very positive things about being a floral designer. We enjoy the creative aspect. 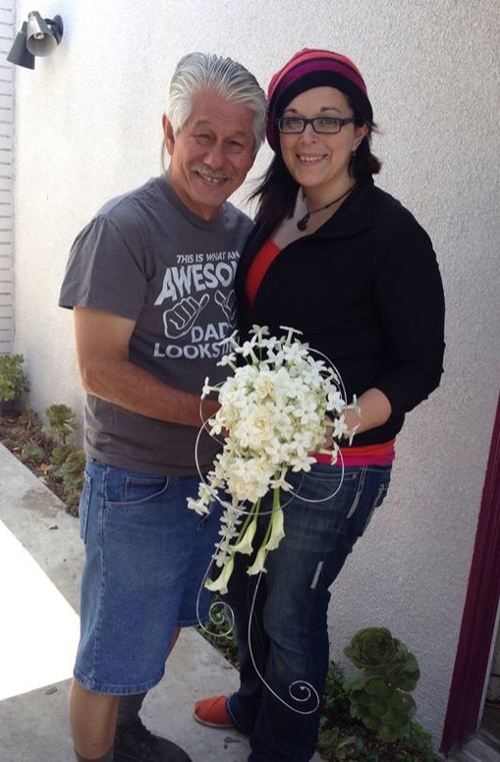 We enjoy helping people and making their lives better through floral art. EVERY field has its advantages and its drawbacks. If we want to continue to attract talent to our field, florists should be positive in their public comments about our industry. If you don’t feel positive, you shouldn’t be in the field or stay in the field. We need to get the word out internally in our field. With our ever-changing industry, where have you seen the floral industry change the most over the past 5-10 years? And where do you see the floral industry heading? There are so many. We could talk about the impact of online shopping. We could talk about consumers becoming better educated by exposure to a huge range of floral art ideas from cultures all over the world. We could talk about changing customs regarding sending flowers for sympathy. We could talk about the impact of studies that empirically show how floral products make people happier and impact positively on our lives…..All of these have changed our field and will continue to do so…. We have a situation today where floral designers are creating things for their clients that are representative of a huge range of approaches. For example florists sell crowns of flowers… a kind of design that can (with varied mechanics) be traced back to ancient Egypt, Greece and Rome. 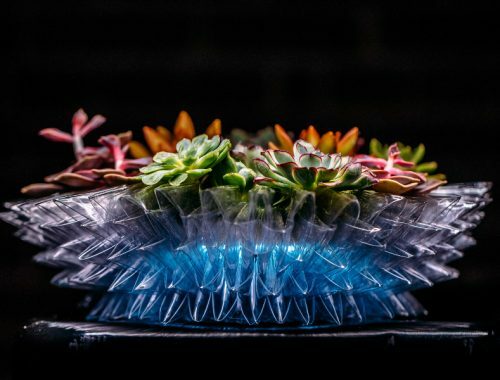 Floral Designers design in water. But guess what? Styles in water can be traced back hundreds of years, along with the hand tied bouquets that are all the rage now. 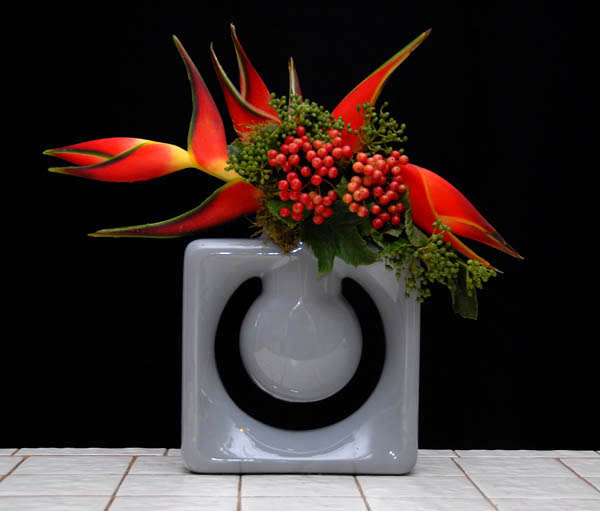 The bottom line is that ancient forms of floral art are now coexisting and marketed along with new and contemporary ideas. It means that the concept of a designing style or approach being “old” and therefore “less desirable” or “new” and therefore “more valued,” has lost much of its meaning. (In spite of our insistence of talking about new styles and trends). 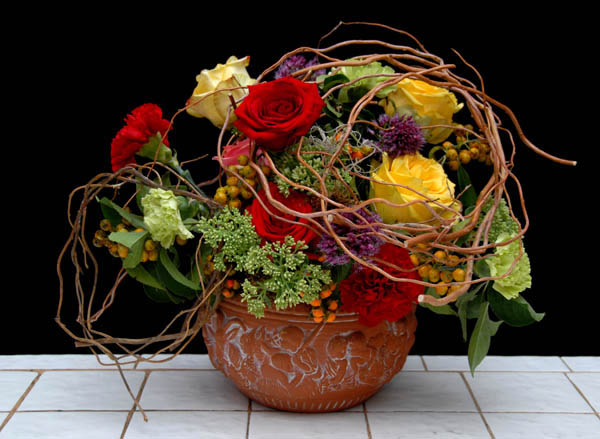 At Rittners Floral School we teach our students that the ultimate goal is to be able to meet consumers emotional needs through floral art that incorporates both older and newer approaches to achieve whatever look or approach is desired. And where do you see the industry heading? I think there will always be a need for floral designers to create things that will amaze, delight and make people’s lives better. There will always be a need to celebrate important life cycle events and occasions using flowers and their design. 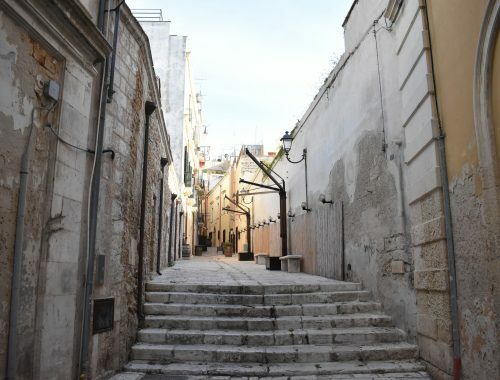 But the future is ours to shape and create….I would like to see a continuity of the kind of fascinating eclecticism mentioned above. I would like to see a greater understanding by the public of floral art, as an art form that requires knowledge and discipline. Just as people enjoy their daily cup of coffee or their glass of wine with dinner I would like to see flowers and floral art becoming an important part of everyday life. 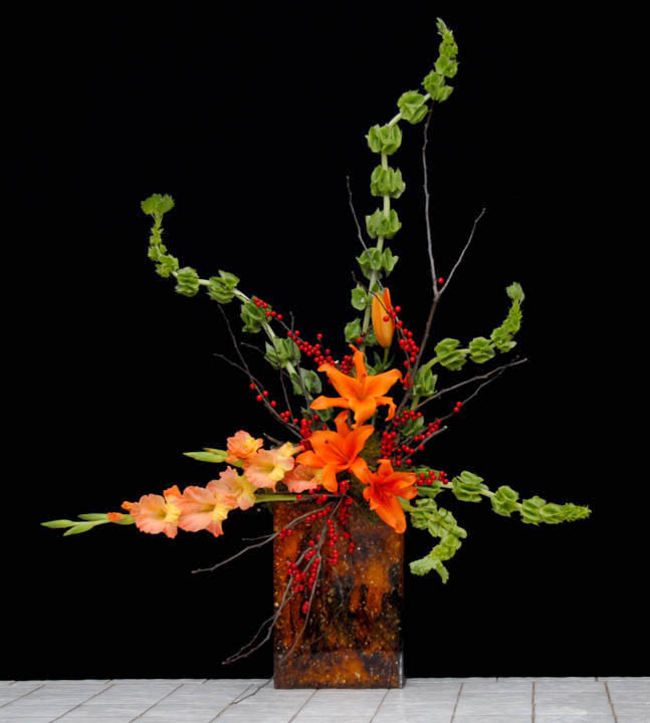 I think that modern communication technology– computers, digital photography/videos and the internet have certainly played a major role in floral education as well as moving the industry forward. The fact that a floral designer can post photos or videos of his/her work online and within seconds have other floral designers see it all over the planet certainly allows sharing, and a much faster rate of disseminating information than ever in the history of humankind. It is truly wonderful to take advantage of this wealth of resources in our classrooms. However, it is simplistic to say that technology alone provides the best educational solutions. Just because we have the technology doesn’t mean that it’s always being used well. 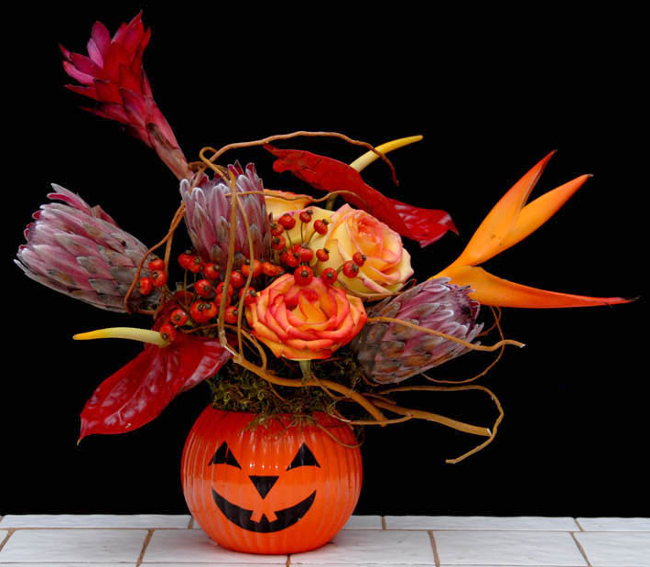 (We have all heard the phrase, “death by powerpoint.”) You can present a floral technique from a distance. That doesn’t assure that the person watching can adequately absorb or perform the task. Having a master teacher actually present to provide guidance and feedback is important. I think that all too often web based approaches are used to avoid human contact or to provide self-serve solutions. 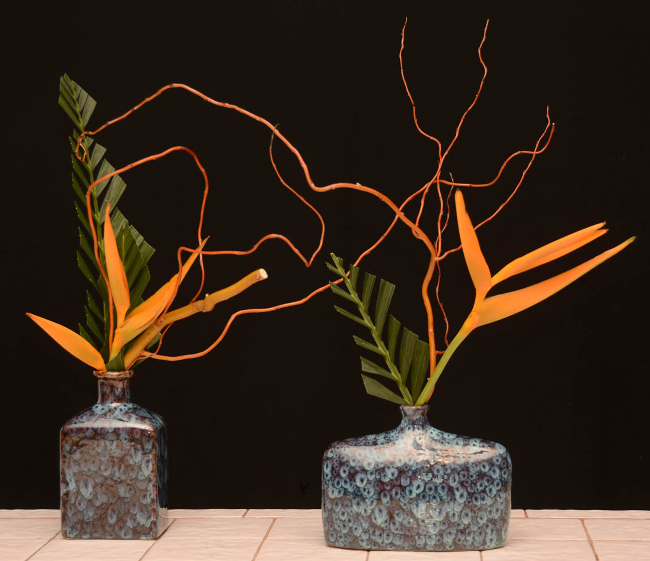 At Rittners Floral School we use the best features of the new media, but we also are quite aware of their potential shortcomings and pitfalls. In our diploma programs we combine the new technologies with live demonstrations and hands-on floral designing labs–the best of both worlds. The choice of seeking floral education should involve trying to make a good match between the student’s needs, their schedule and available programs. Picking a program or workshop simply to say that one studied with a specific individual or in a particular location may be ego enhancing, but is not necessarily an indicator of a good match or fit as far as what you will actually learn. I think that the student should reach out to the person in charge of a program and talk with him/her. Is the boss actually teaching? Is it a real school, or just a traveling show? Is there a real commitment to the student that will extend beyond the hours of class time? Remember that just being a content expert is not a guarantee of good communication or teaching skills. Does the program actually have a facility with back up resources such as library, media equipment to enhance the teaching, etc. or is it in a temporary borrowed space? And how is the personal chemistry between the student and the instructor? All of these factors should be considered when deciding to take a class or workshop. 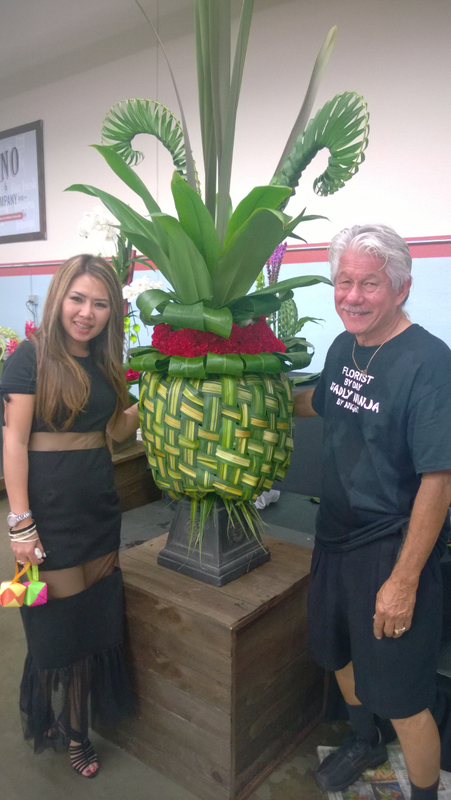 Our Philosophy In Floral Education Teaching floral art is our primary function at Rittners, not a sideline or an extra outlet. It is what we do. 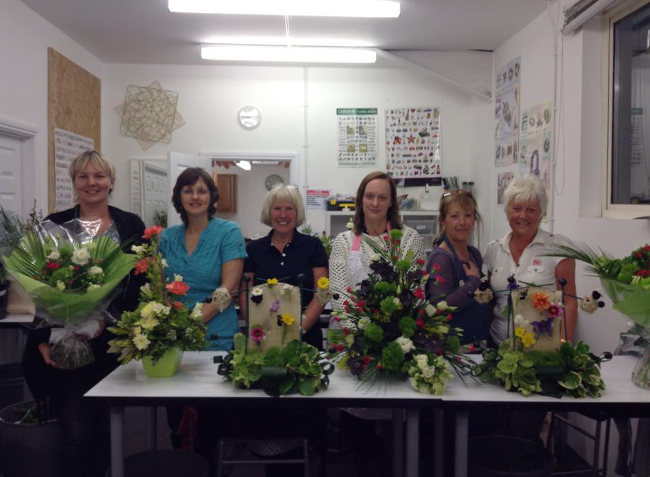 Our philosophy is to provide courses in professional floral designing skills that give outstanding value… To provide the kind of course that one would recommend to family and friends. We believe in providing courses that are complete packages, not in programs that require students to take a huge number of separate programs without closure. We measure success in teaching floral designing by focusing on the quality of our courses and on a student centered approach. 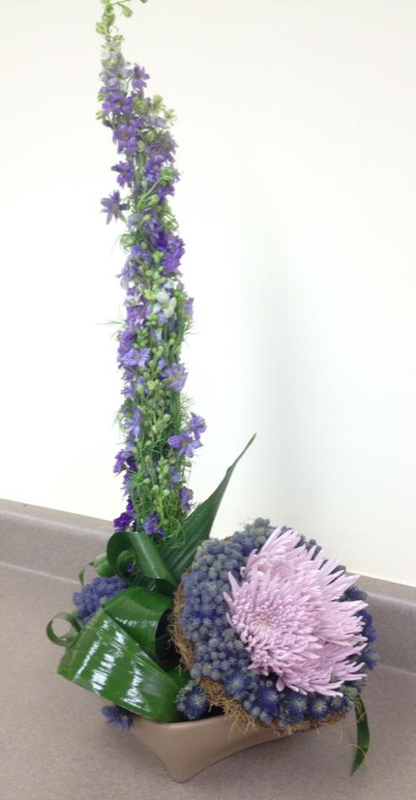 Big thanks to Rittners School of Floral Design for taking the time for Floral.today and our followers. Check out all the courses offered and Rittners School literature to help further your education and design. 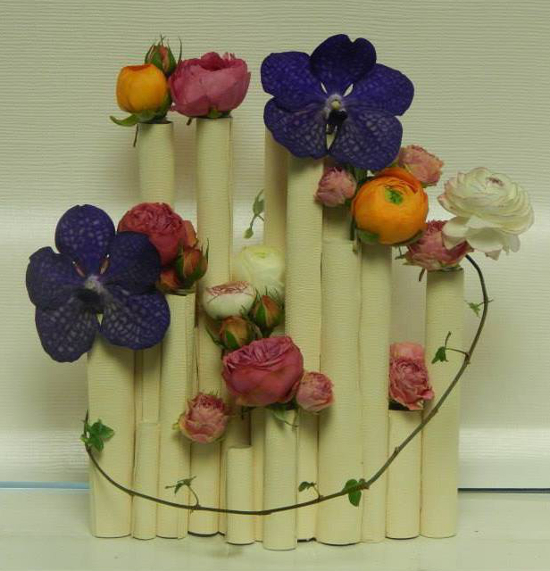 The UK School of Floristry is one of the UK’s leading floristry schools, providing excellent training and development on beginner, professional and master class courses in floral art and design. 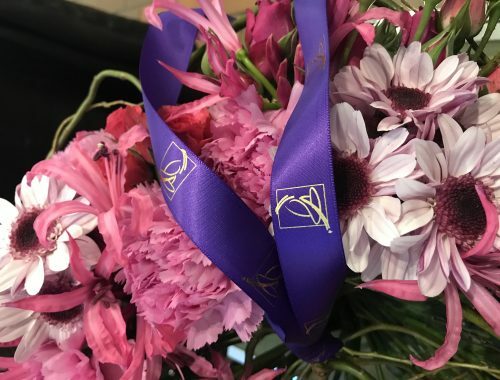 The UK School of Floristry is lead by one of the UK’s leading botanical artists, Joseph Massie, with five RHS Chelsea Gold Medals to his name, the School is a vibrant hub for developing talent and excellence in the floral industry. 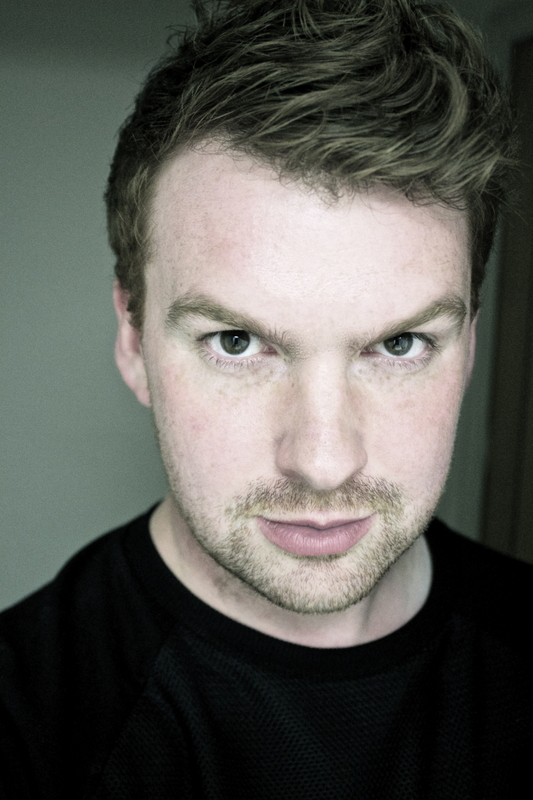 Joe is one of Floral.todays favorite international designers to watch and we look forward to the exciting future the UK School of Floristry has to offer. YOU CAN FIND ALL THE CONTACT INFORMATION FOR The Uk SChool of Floristry AT THE END OF THE ARTICLE. 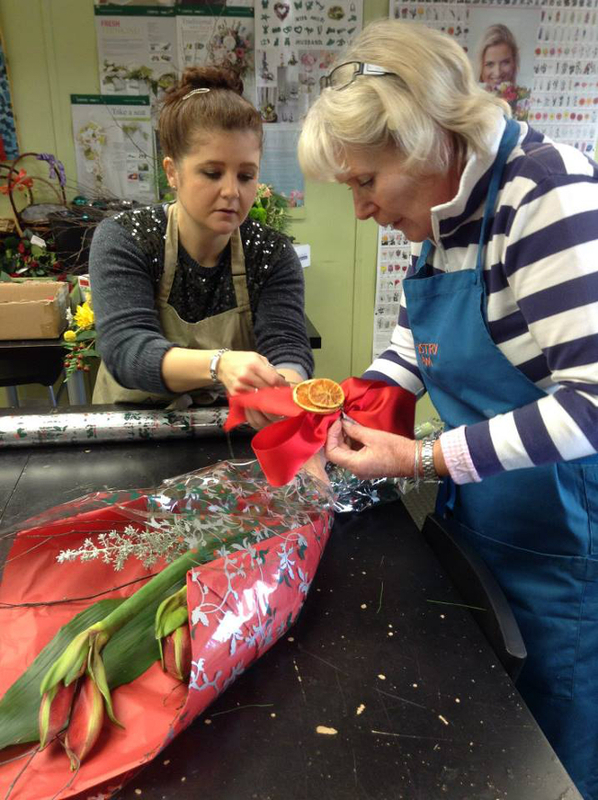 Where have you found the great impact when teaching floral design, demonstrations or workshops? I love teaching students that are just at the very beginning on their journey. 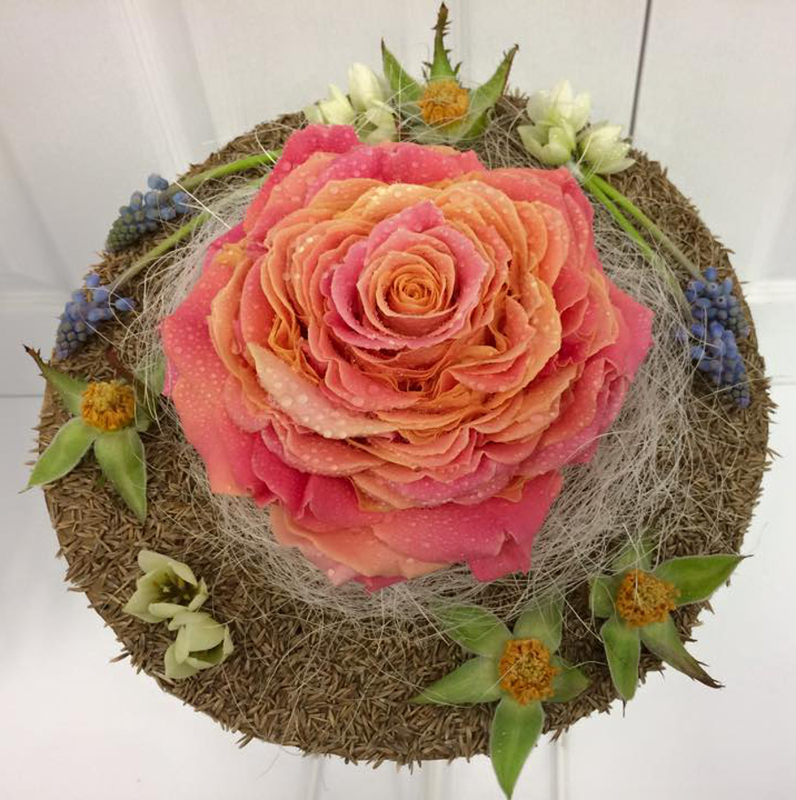 Teaching the principles and elements through practice and theory, how to spiral a beautiful hand tied bouquet, to the perfect way to wire a rose bud – that is where I get the greatest joy. 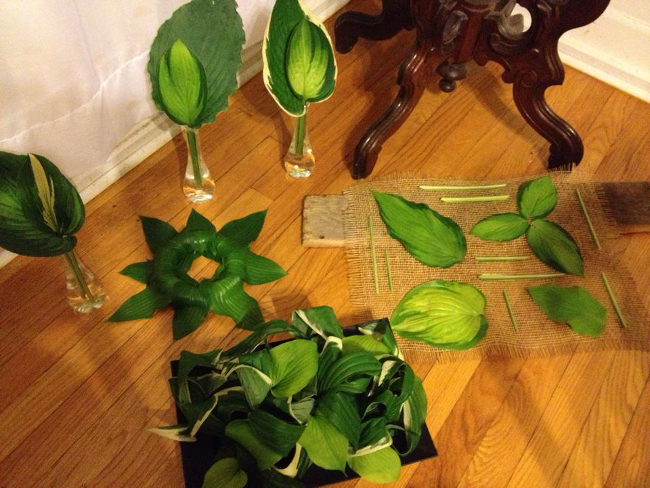 What struggles have you found with teaching floral education around the world? When teaching around the World, sometimes you can have small issues in venues with incorrect materials, or maybe sometimes you’re missing just the right container that you’d for the job, but it’s never a huge problem, you know. There are ways and means. 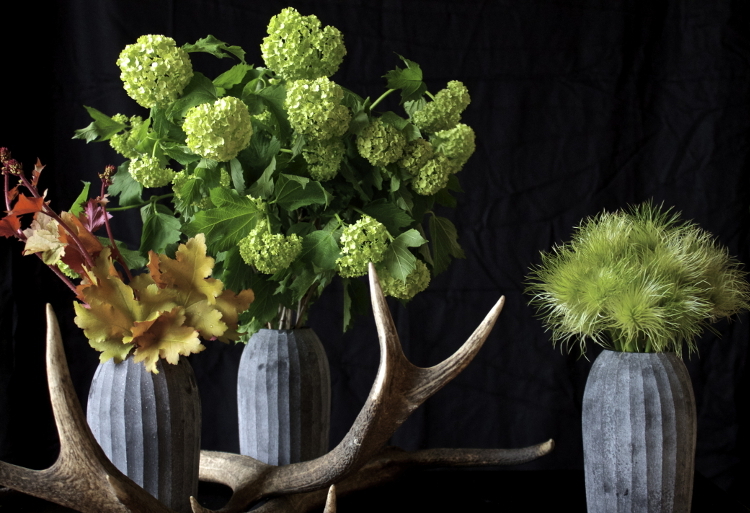 I must admit I get a little fatigued of seeing repeatedly simple courses by professionals on simple loose, natural hand-tied bouquets, or loose natural arrangements. I’d like some educators to realize that the current popular style of loose, natural flowers is a trend, and that underneath, solid, practiced, well rounded design skills are fundamental. A chicken wire compote will not change the World, and a chicken wire compote, created with limited understanding of proportions, origins of growth or line movement is even worse. In my opinion, working with flowers, either in an art or design based practice, is a craft, and one that requires consistent development to stay fresh, innovative and at the top of your game. Continuous professional development (CPD) is essential to ones creativity and passion on the job. The surest way to stop enjoying what you’re doing is to stop innovating, to stop trying new things and to stagnate. Education keeps you fresh, keeps your business fresh, and brings new clients to your door. Its win-win. There’s several good sources for floral education – have a look online by Googling ‘floristry schools’ or ‘floristry classes’, read industry magazines or check social media. Also, take the time to ask around. We’re incredibly proud of our re-booking rate here at the School – our students and their success stories are absolutely our best advert. Over taught classes – average bridal work. 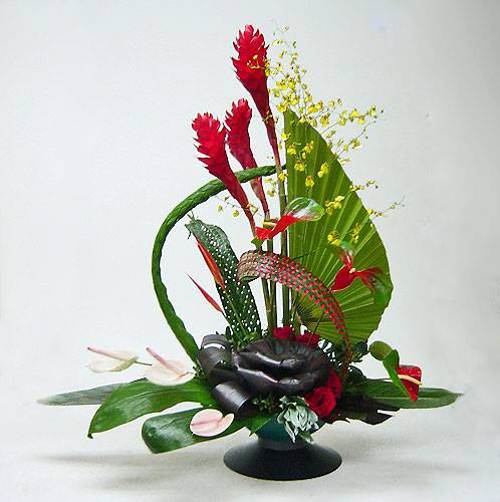 Under taught classes – real floral art and design Masterclasses at an advanced level. It’s something we’re proud to cater for here at the School and we have such good numbers on those classes. 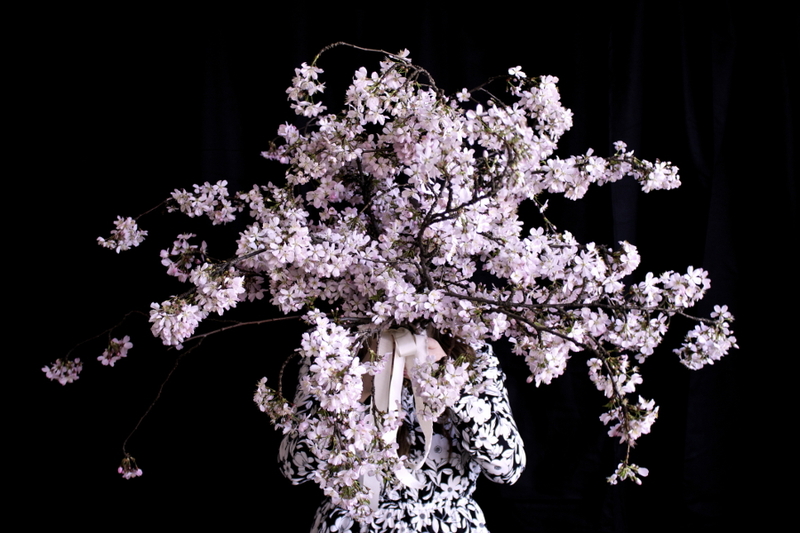 Where have you seen the most drastic changes in floral education in the past 5-10? 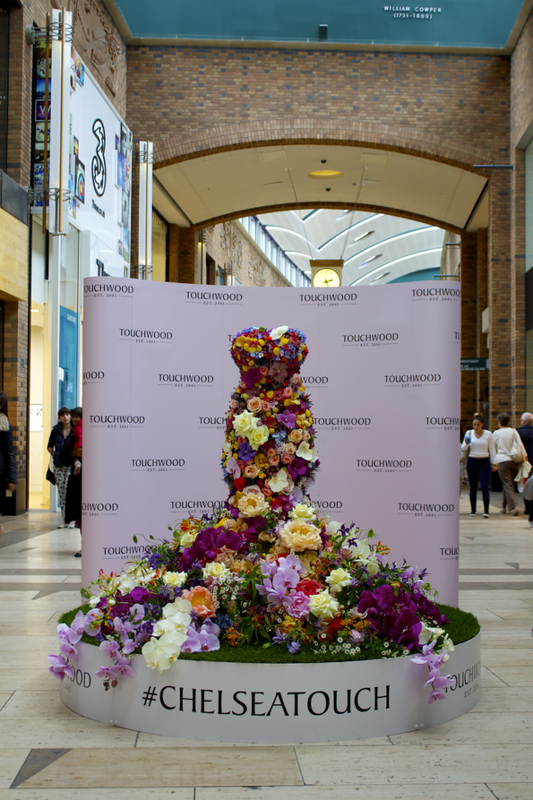 In general we’re seeing so much more interest in floral art and design these days – theres a real resurgence in this practice, and we’re delighted to be a part of that. 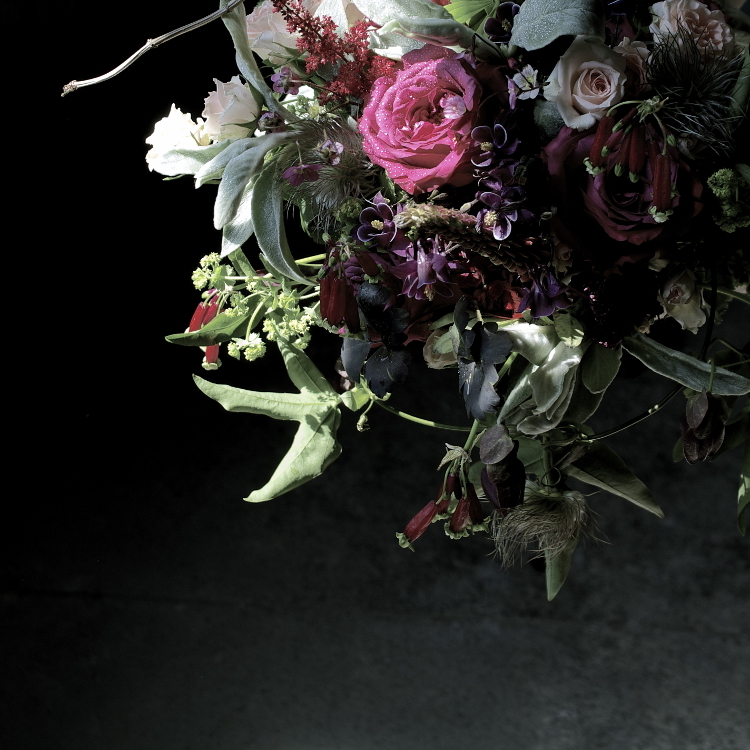 What advice do you have for designers looking to become floral educators? My advice would be to take it slowly, start where you’re comfortable, and really think about the quality of what you’re putting out there. Why are you teaching what you’re teaching? To teach is to take responsibility, both for your craft and for another’s learning. Take that responsibility seriously, and really think about how you can translate the best of your knowledge into another’s skill set. It goes without saying that the internet and social media has changed the way florists around the world operate. You can view the work of a designer half way around the world and gain inspiration with just a few clicks of your phone. It really allows trends, insights and developments to travel so much faster than they used to. Amongst yourself, who would you say are the future floral educators the world should be keeping an eye out for? On my recent tour of Australia, I spent a lot of time with the staff of the Matthew Landers Academy in Perth and was impressed by the talent, skill and dedication of the staff there. Marjorie Milner College of Melbourne was also excellent. 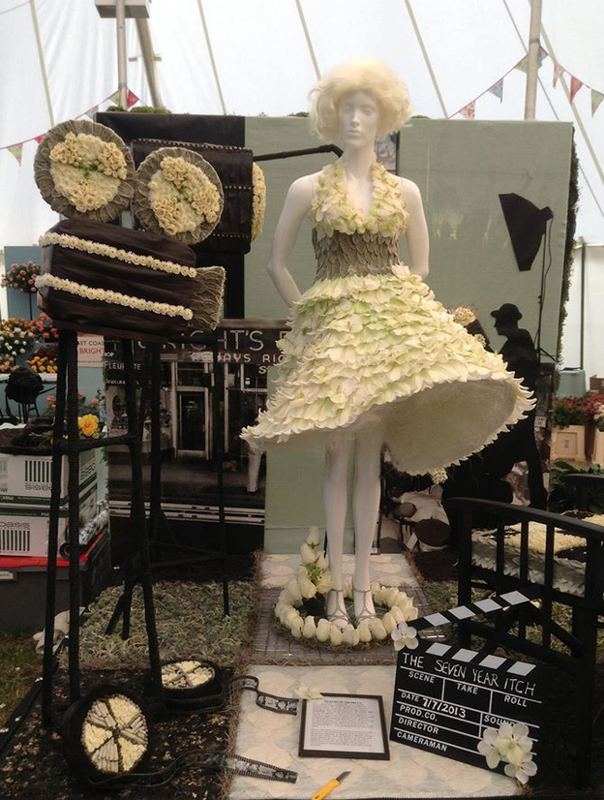 Thank you to the UK School of Floristry and Joe for taking the time to tell us their feelings on floral education. Go check out the many courses that the school offers and to follow all that the school and Joe are up to around the world. What’s Floral Education Month without learning some awesome techniques and sharpening our floral knowledge? 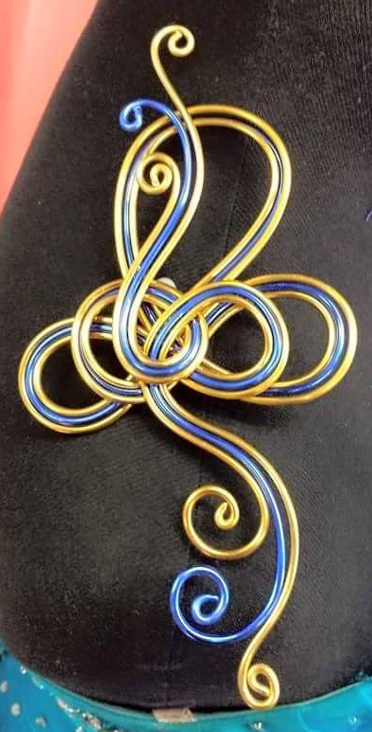 Floral.today found you someone who inspires us with not just his wonderful floral design skills, but his trend setting wire work, Mr. Doug Bates CFD. 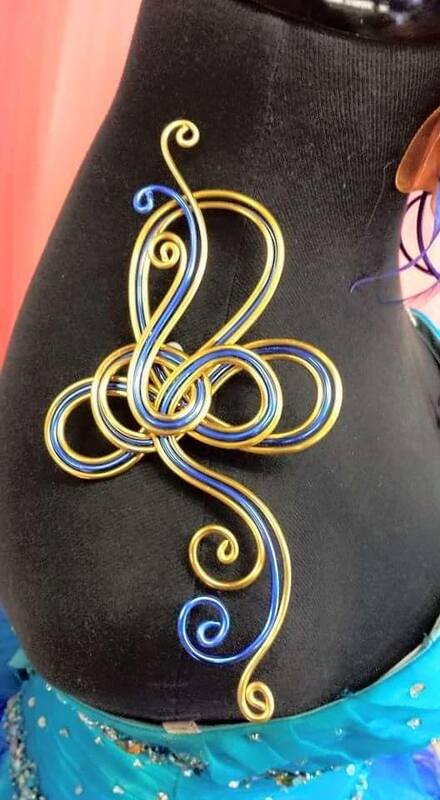 Here are two of Doug’s most recent videos on a multi-wire weaving technique that is great for boutonnieres, corsages and adorning arrangements. So enjoy and make sure to not only leave Doug your comments, but to also share the videos with all your friends and colleagues. YOU CAN FIND ALL THE CONTACT INFORMATION FOR Doug and what events he will be at, located at the end of the article. So what did you think? We appreciate and thank Doug for being a floral trendsetter and look forward to the bright future he has in our industry. 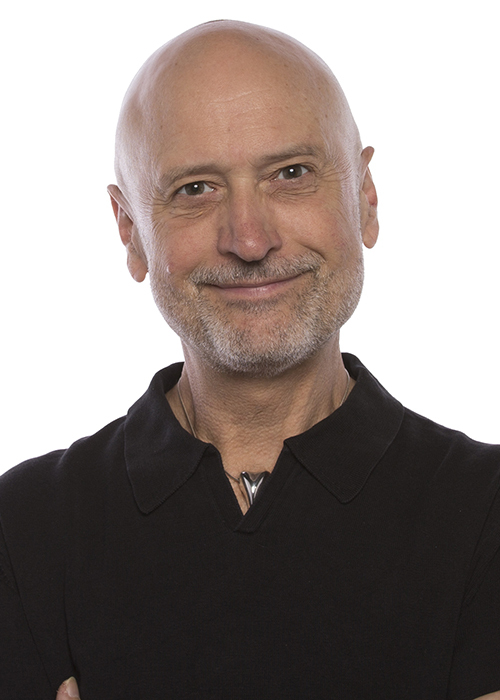 Make sure to check Doug out at this years AIFD Symposium in Denver where he will be inducted into AIFD and will be presenting for Fitz Designs. You can also see his beautiful work at this year’s Nature’s Creative Edge in Fruitport, MI. Again make sure to go show Doug some love as he continues to bring amazing skill and trend setting design to our industry. 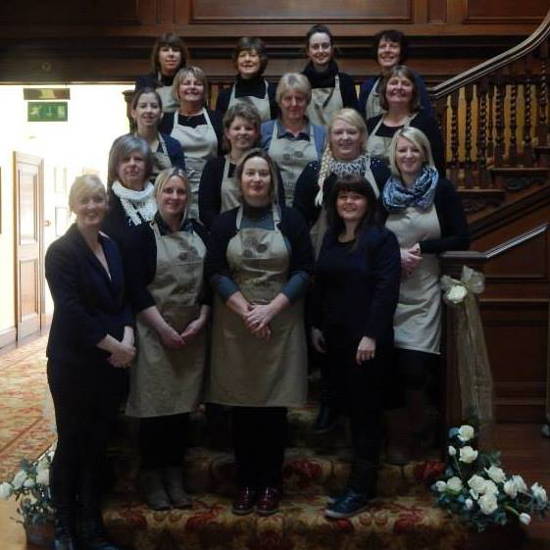 From their redundancy four years ago at their local college, Jo Richards NDSF, FBFA and Helen Boyt ANCF, KTLLS where able to create the award winning Academy of Floristry located in Bournemouth, Dorset, UK. 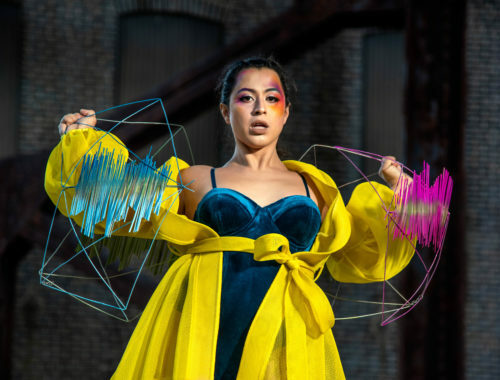 Under their guidance these talented ladies have created the perfect atmospheres for designers of any level and from all corners of the earth to flourish and become top notch professional designers. 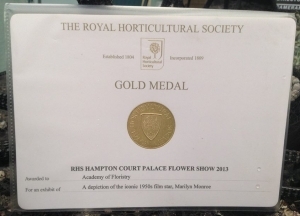 The Academy of Floristry has won many accolades, some of their most cherished being 3 Silver-Gilt medals and 1 Gold medal at the prestigious RHS Hampton Court Palace Flower Show, and you can look forward to The Academy of Floristry’s design “Musicals” at this years RHS Hampton Court Palace Flower Show June 30 thru July 5th 2015. Floral.today thanks them for taking time for us and Floral Education Month to share with you just a few thoughts about floral education. 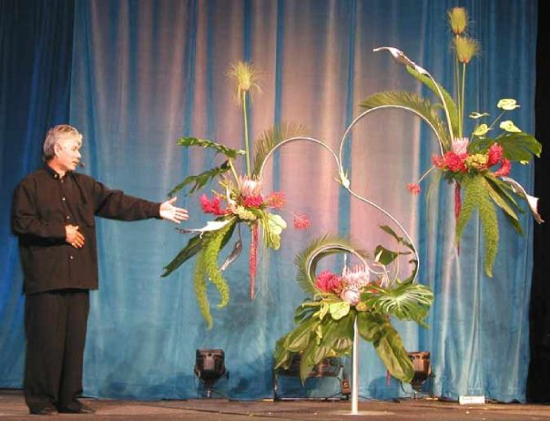 Is The Academy of Floristry known for any particular style of floral design or distinct class structure when it comes to floral education? With lots of knowledge and experience we try and use a vast amount of skills when demonstrating to the industry or our own students. We are dedicated and lucky that we have been able to still offer professional qualifications with City and Guilds and recreational classes to our clients in Bournemouth. The Academy has also become renowned for its competition work, with students entering the Chelsea Flower Show, and Hampton Court Flower Shows and winning RHS medals. We also run a very successful in house wedding and advanced wedding diplomas for all those wishing to learn new techniques and methods, and develop their skills further. The New City and Guilds Higher Diploma and Masters level’s 4 & 5 have been really interesting and very educational for the industry we are in today, they challenge and stretch students abilities, to learn and re-educate our clients, to all the other possibilities with floristry and floral design! You never stop learning in our industry, and are never too old! with so many new products , new methods and techniques to apply, keep an open mind , and keep re-educating yourself and your clients. Fashions and Trends come round time and time again, by putting new twists on them makes them fashionable once more. 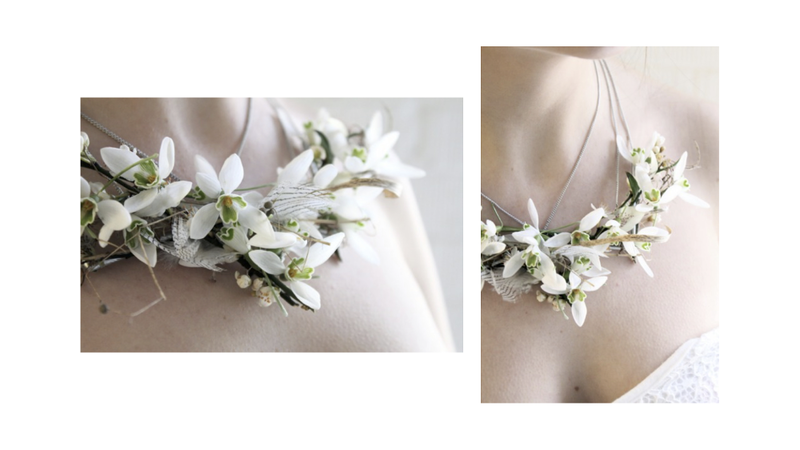 With our ever-changing industry, where have you seen floral education change the most in the last 5-10 years? 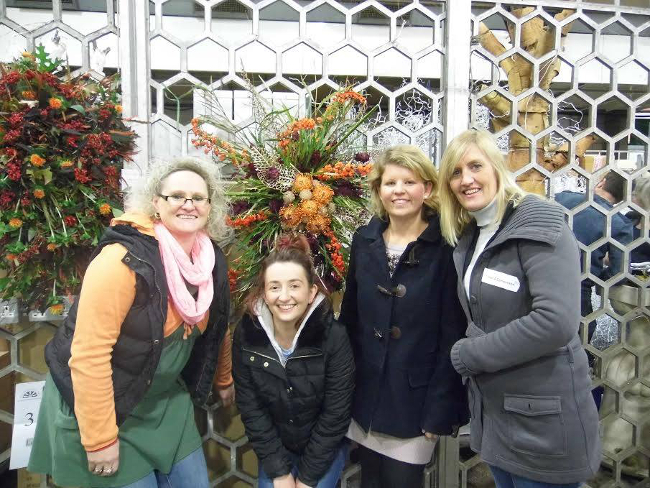 More adults wanting career changes to learn and become florists/floral designers, as life and health becomes more important than money, people want to live to work, not work to live…… Our floristry designs are becoming more European with more designers from the continent working with us to develop a design schema we all follow. I grew up in the floral industry when wiring designs, was very important, I think there are quite a lot of florists today who do not feel confident with producing a full wired bouquet, because easier methods are available. What difficulties do private floral institutes face that normal floral shops and companies don’t face? I feel as a private school we do not have any shortcomings in the educational world, clients come to learn and be here because they want to be here to learn. When teaching floral classes, what do you hope your students take away from the experience the most? Enjoyment, learning and succeeding with new skills learnt. 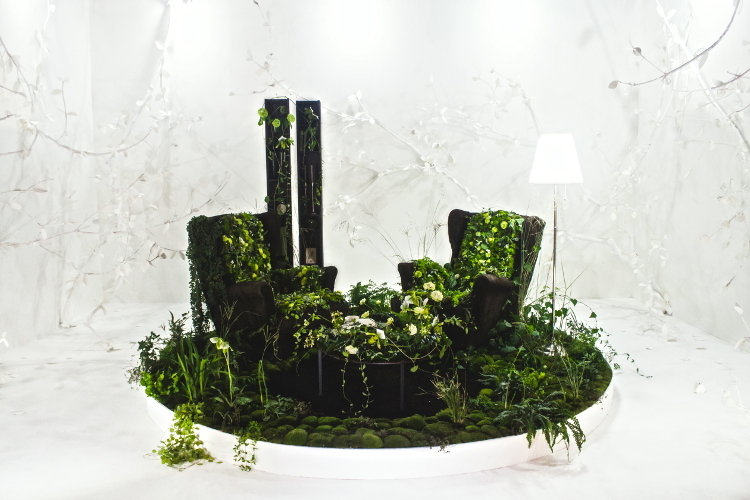 To be confident in what they have learnt from us to be successful florists of the next generation. Being an independent training provider, and being extremely passionate about what we do, who we are and what we deliver! Being able to further our students career paths, making sure the students feel, and realize it’s all about them, everything we do is for them and their success. For the industry to realize the students are our future florists who will carry on where we finish off. 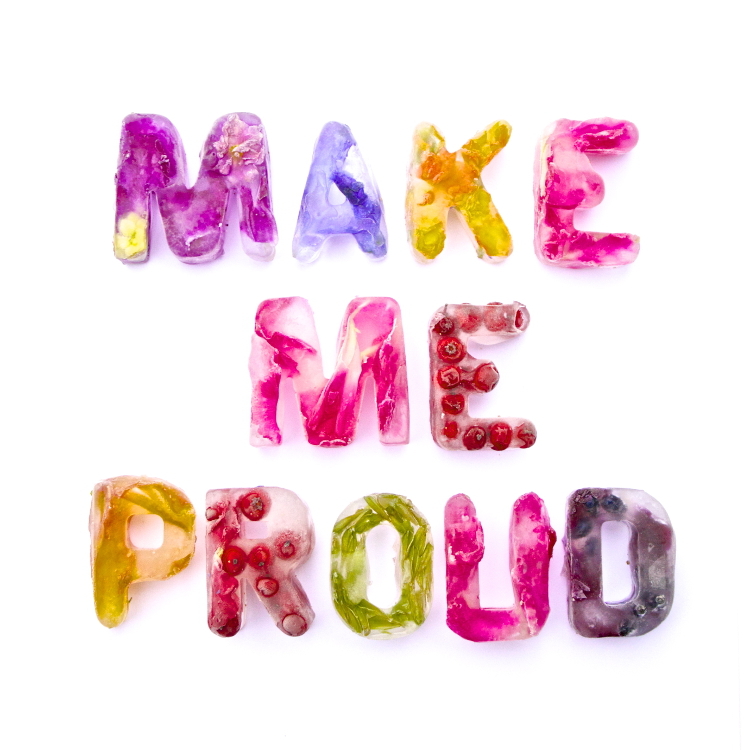 How do you believe the UK could increase its industry awareness to attract younger designers? Show The Academy of Floristry all your support. 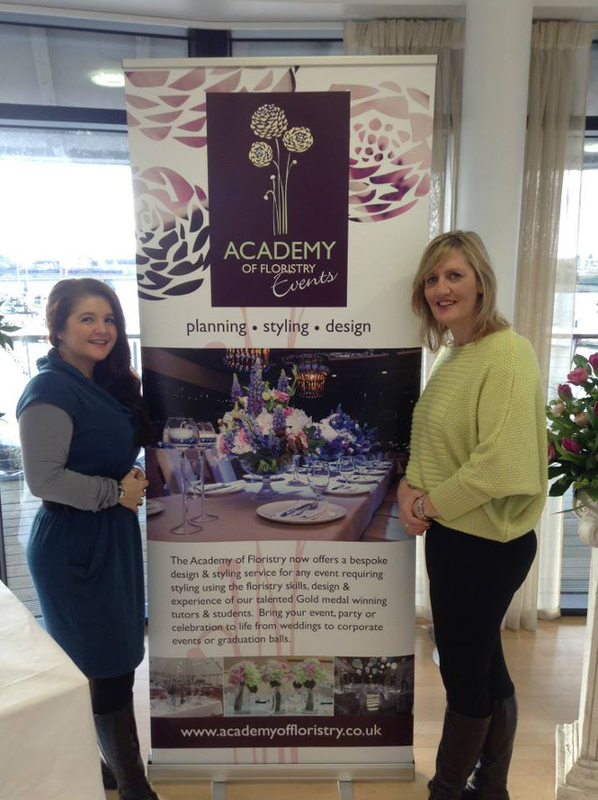 Thank you again to The Academy of Floristry for welcoming us into their world of floral education. Make sure to check out all their available course and keep yourself growing and striving to always be a better designer. 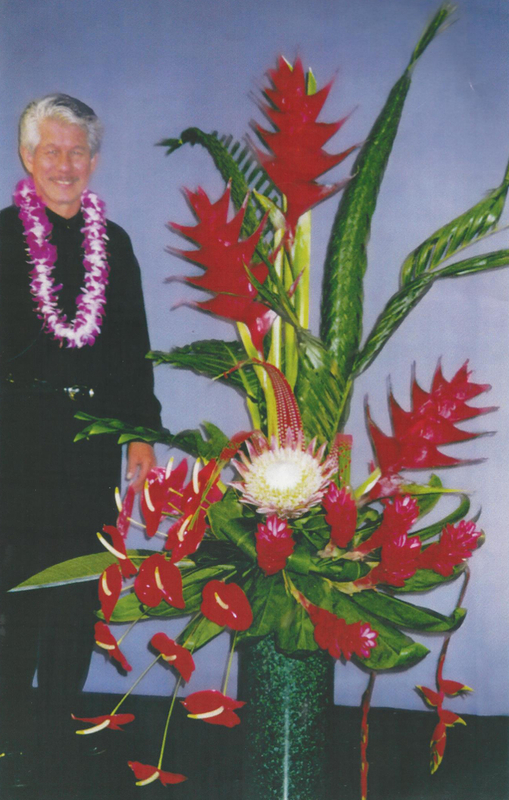 Join us Friday with the ever exuberant Phil Rulloda AAF, AIFD, PFCI of Phil Rulloda Southern California School of Floral Design as he tells us all his thoughts on floral education. Check out all the Floral.today social media for quick floral education shoutouts through out June.